Who’s ready for a break from all of the white painted kitchens we have been sharing so much of? Please hear this friendly reminder that while white kitchens continue to grace the covers of home design magazines and HGTV shows… that look is not for everyone. 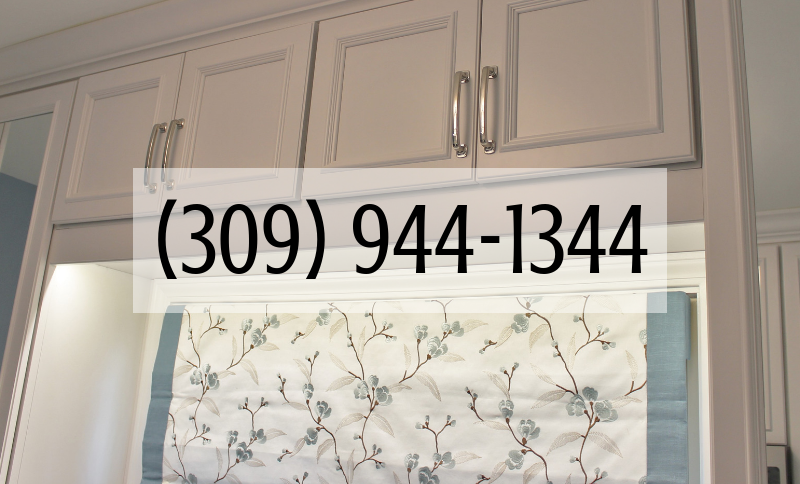 Thankfully our team is here to make YOUR kitchen dream a reality, not someone else’s! 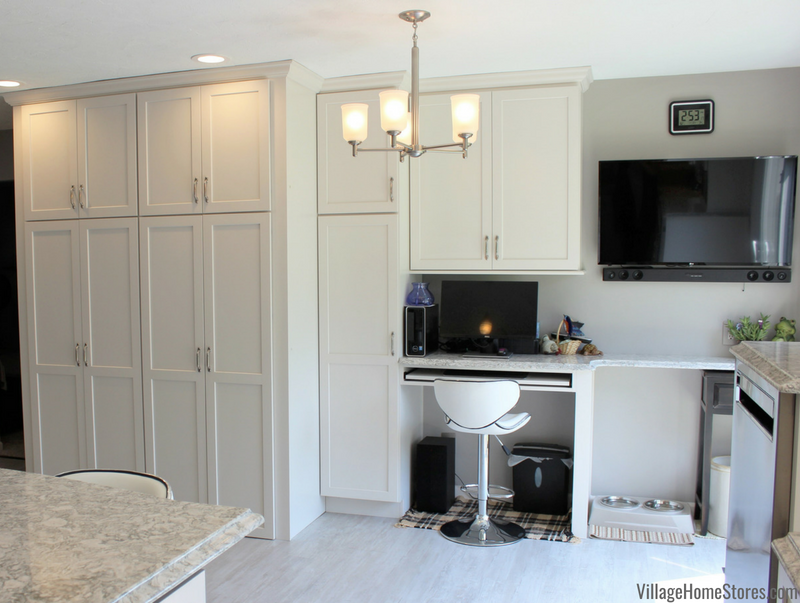 Take a look at this sophisticated new kitchen remodel we just wrapped up in Taylor Ridge, IL with a refreshing new take on painted cabinetry. 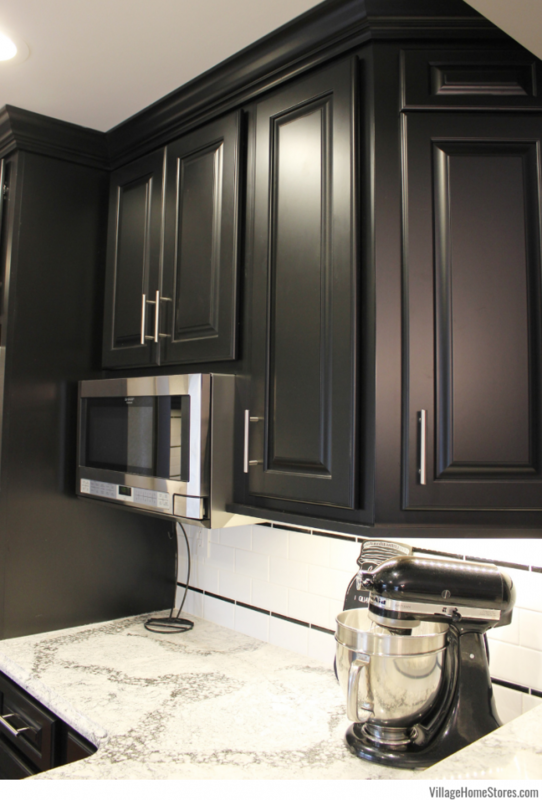 Our best-selling raised panel doorstyle from Koch Classic is named “Seneca” and in this new kitchen we have included a Maple wood with “Black” painted finish from Koch. Five-piece drawerfronts (see island cabinet above) offer lots of added edges for the light to highlight this rich painted finish. 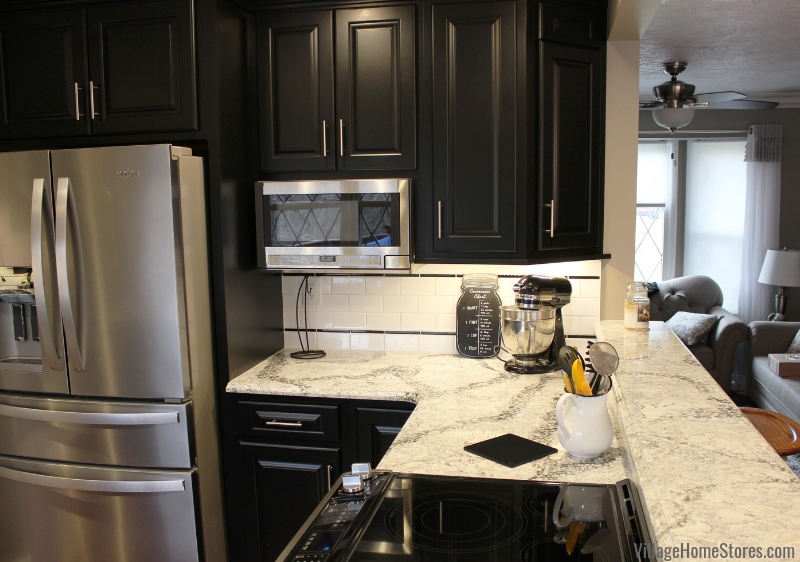 Many would think that a black painted kitchen would be dark and cold but take a look at this bright and inviting new space! We have added a great new lighting plan, removed a portion of a wall, and even included glass in the doors above the kitchen sink. A key element in keeping the space feeling bright and open is leaving plenty of walkway space surrounding the downsized kitchen island. When you are in this new kitchen you would never use the phrase “downsized” to describe this island in reality. It is exactly the right size for the kitchen design. It’s all about scale! 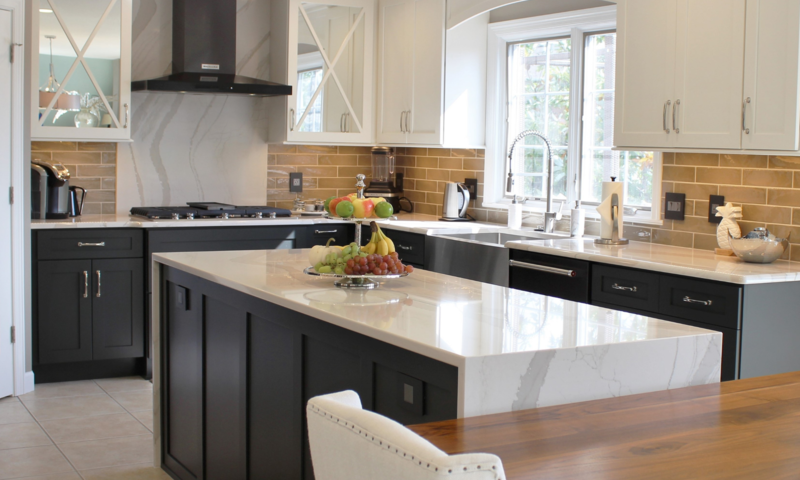 If you have been curious about fitting an island in your own kitchen design, let one of our expert designers see what could fit for you within a functional layout. In this case, one very large base cabinet was simply ordered at a standard shallower depth of 18″ instead of 24″ and the one modification created the perfectly-scaled island cabinet. That shallower depth still allows for a functional drawer above the lower storage and now gives room in this space for a countertop overhang for seating. The result is a centrally-located surface for prep and casual dining. The large quartz counter surface of the island is now within reach of the sink wall, the refrigerator wall, and the cooking zone of the kitchen. We were able to keep these beautiful existing cherry hardwood floors from the original kitchen because the peninsula layout didn’t change and we did not remove the lower half of the dividing wall. Across the room from the kitchen sink you will find the 4-Door Refrigerator and cooking zone. Our Sharp Over-The-Counter Microwave is tucked into the area between the two. This nook creates a great location for small appliances and would make a wonderful location for a coffee station in the kitchen. Our team removed a large section of a wall that divides the kitchen from the dining room and nearby living room space. We capped off the half-wall with a long slab of matching Cambria quartz. This large pass-through area now creates the open concept design that this home truly deserves. And with two outlets on the inside of this ledge, this becomes a great counter for serving guests and entertaining. Speaking of entertaining, on the half-wall that divides the kitchen from the dining room is a new Whirlpool electric front-control range boasting 6.4 cubic ft. of capacity! It also has convection features allowing a consistent oven temperature and the ability to cook with all racks at once. 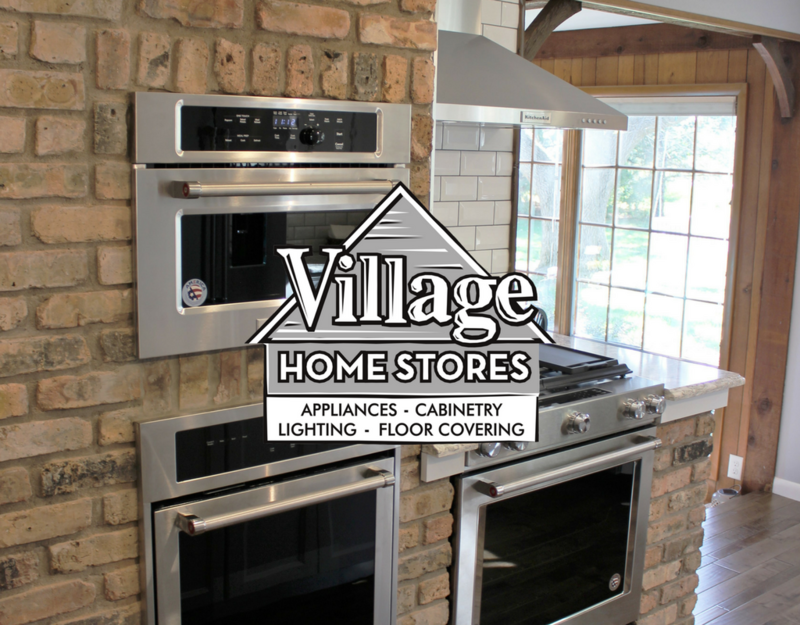 Shop your local low price guaranteed prices on all appliances from Vilage Home Stores right here on our website. We service the the Quad Cities and many surrounding areas with appliance sales and service. We have noticed a rise in popularity with matte black finishes in our industry. 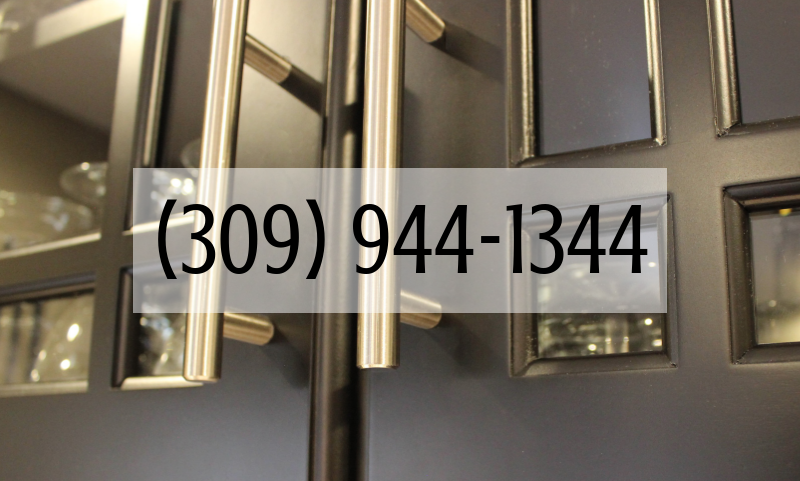 Our Black Stainless appliances continue to be very popular and honed and brushed finishes on black countertops is also requested often. Tile surfaces, lighting, and plumbing fixtures as well as home accessories are all trending to a matte black look. 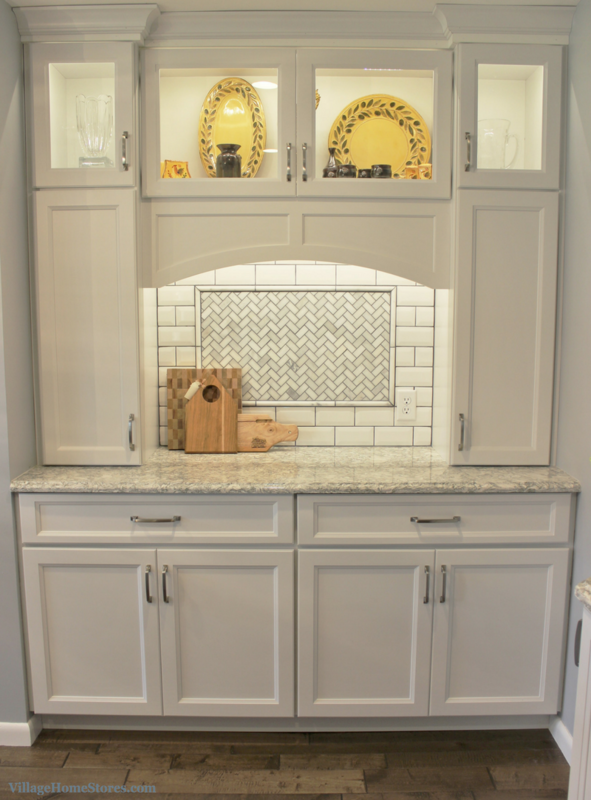 We love the level of sophistication it can bring to a cabinet design. Just look at how the daylight shows off this great stylish finish! 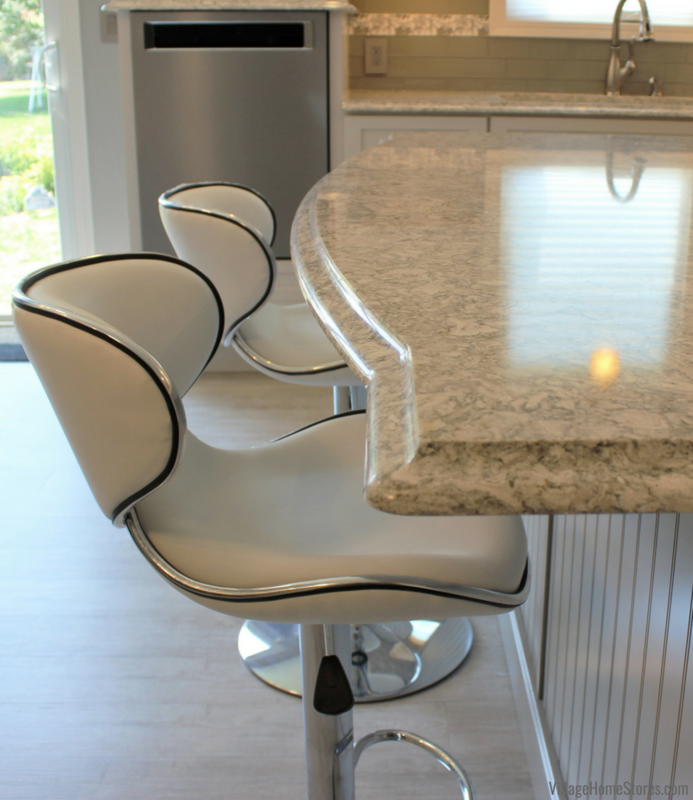 The quartz countertop surfaces in this Taylor Ridge remodel are from our Cambria Quartz line. 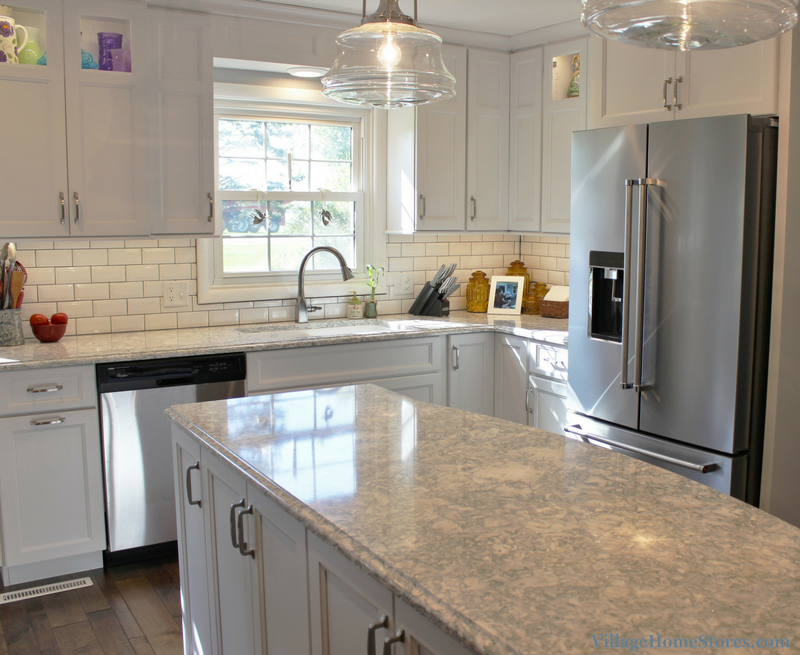 The “Seagrove” design is a bright blend of whites and shimmering silvers plus gray and black flecks making it the perfect way to tie in all of the new finishes in the kitchen (psst! ask your designer about some of our exclusive priced Cambria options). An Ogee edge profile was applied and we think it really compliments the raised panel details of the cabinetry doors and drawers. Of course our customer favorite Diode LED tape lighting helps keep the space bright and warm. Learn more about that system in our last blog post. If you want to see more images from this kitchen remodel then click here to find a full album on our Best of Houzz award-winning profile. If you want to embrace the black trend for your own kitchen or bathroom space, be sure to follow this board on our Pinterest page. Are you ready for your own dream kitchen to become a reality? Your first step is just to simply reach out to our team. We will then walk you through our process and help answer any questions you may have. You can call us at (309) 944 1344 or complete this short form online to send us a message. We can’t wait to hear what you are working on and find out how we can help! Don’t forget that we have many financing options available including a fantastic option for our Cambria customers! 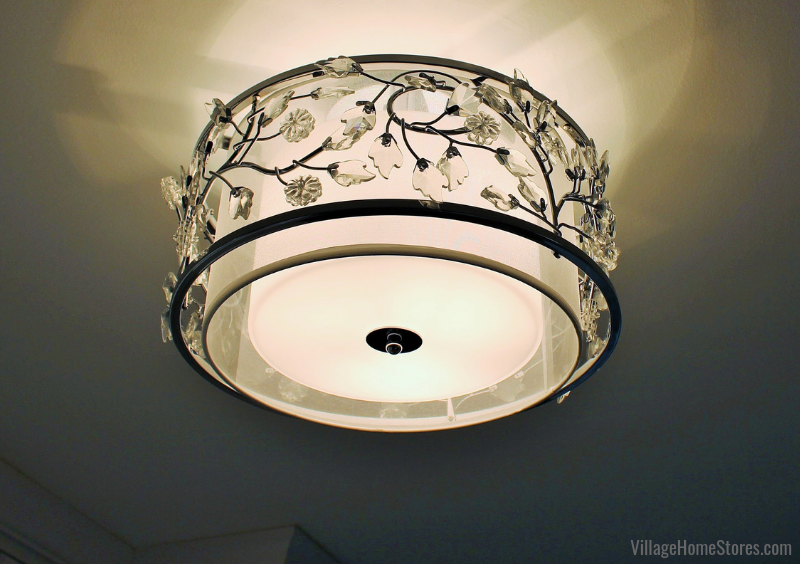 At Village Home Stores we have the great privilege of transforming spaces in our customer’s homes. These aren’t just any spaces, kitchens truly are the hub of all activity in a home. Remodel stories that begin after years of use are some of our favorites. Nothing makes you appreciate the transformation of a room more than truly living and experiencing the before and after. 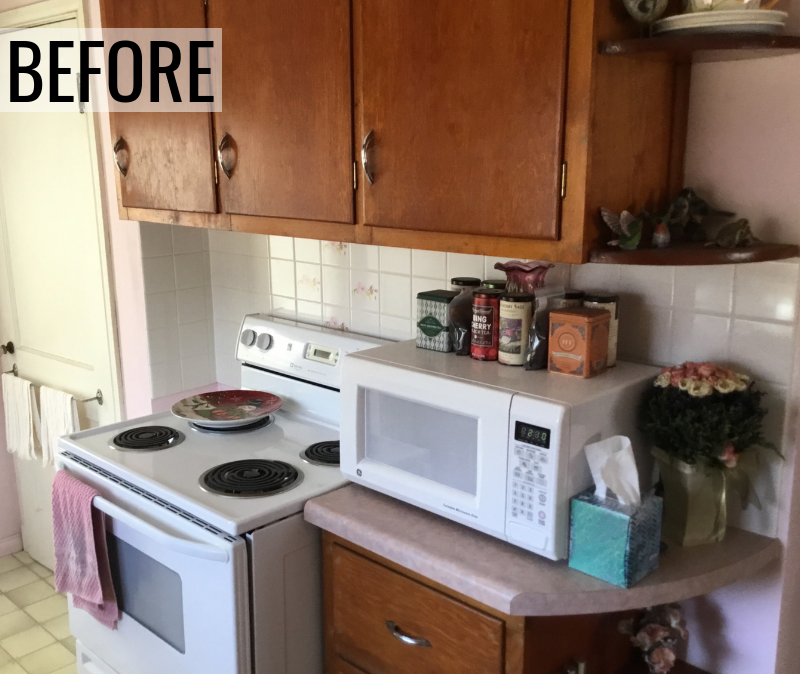 While that can be hard to translate to a blog post, we do think you can get a pretty great idea of this kitchen before and after just from the images. 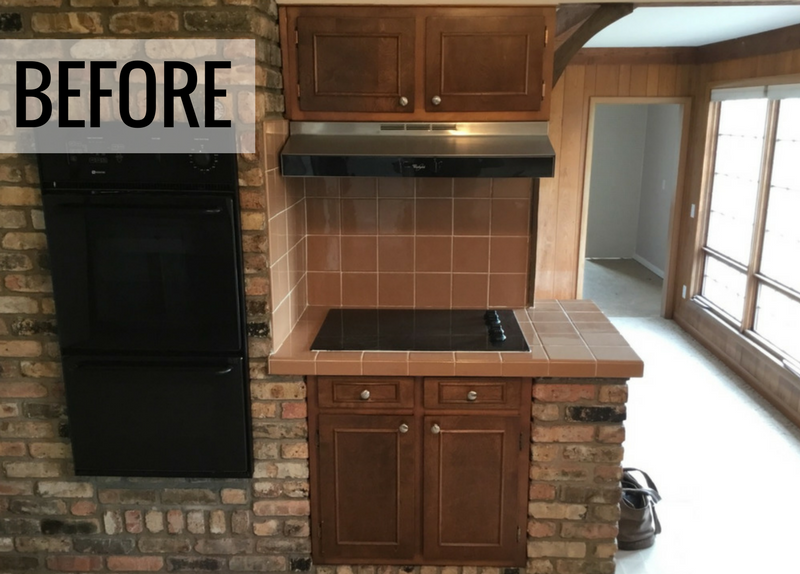 This Muscatine, Iowa kitchen remodel is a wonderful example of how you can totally transform the look and function of a space without removing a wall or re-locating major appliances. Just look at the difference in the room just from the material choices! Dark, slab-style cabinetry has been replaced with a bright painted white. Added lighting helps to enhance these selections and make this new space bright both day and night. Painted cabinetry from our Koch Express line in the “Prairie” door with an applied molding detail. This doorstyle takes the look from a Transitonal flat-panel door to a more “Cottage” or “Coastal” style. That Coastal vibe is achieved with the material selections in colors and even textures. 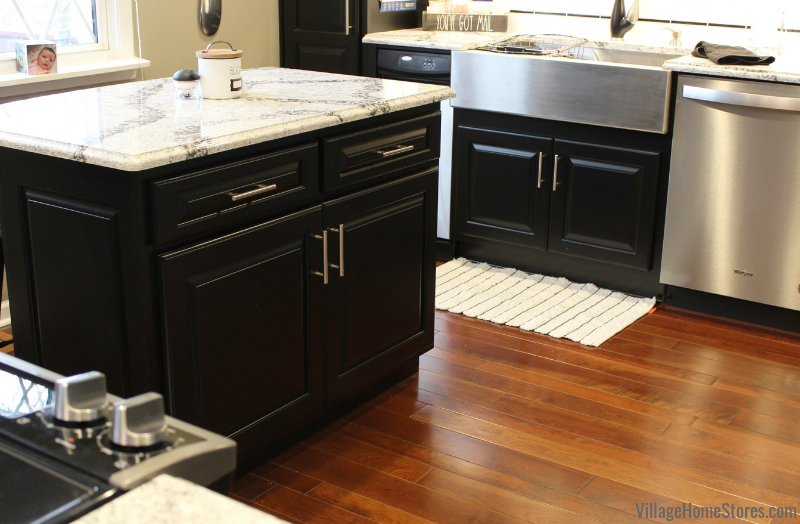 Alterna Luxury Vinyl Tile in a 16″ x 16″ tile and the “Glacier” color create a durable and comfortable flooring choice for the new kitchen. 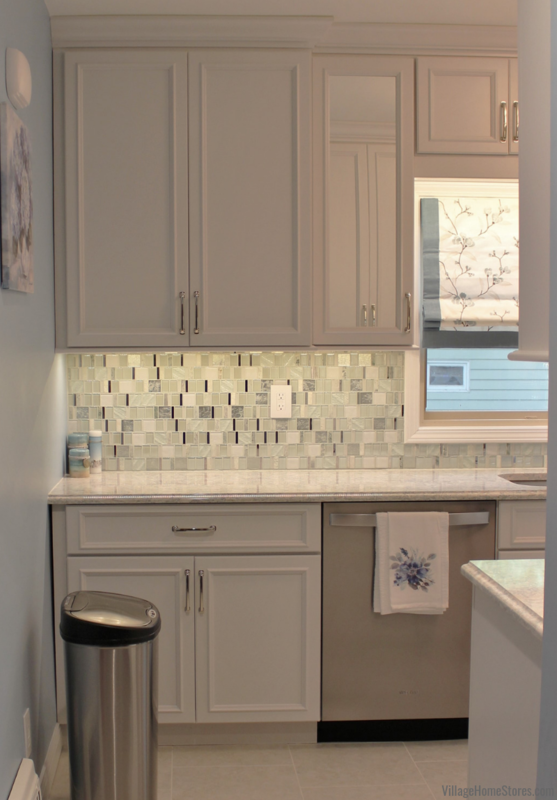 While the floors give a white sandy look, the mosaic backsplash makes you wish you were on the beach collecting seaglass. This mosaic is from the “Academia” series by Glazzio and the color is “Aviaton Mint”. It is a beautiful combination of varied textures and tones of soft green glass and even mirror tiles mixed in. You would honestly think that the tile was made just for this countertop choice too! 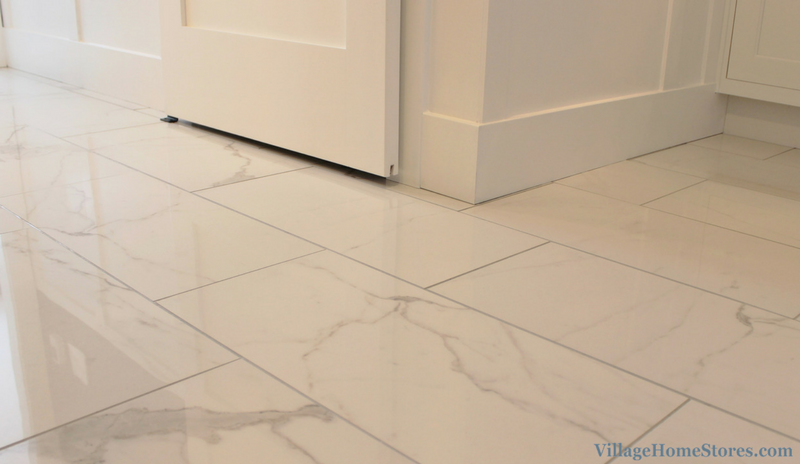 Cambria Quartz in the “Montgomery” design is the perfect compliment to the colors in the tile. An ogee edge profile has been applied. Using a decorative edge in a galley kitchen design like this is a great way to make a small design choice that makes a big impact once installed. The new kitchen design makes the most of the available space with landing space now on both sides of the range and an installed microwave hood above. The use of a microwave hood here not only frees up countertop space, it also provides needed ventilation for the cooktop. Again, notice the ogee edge in the next image. Such a beautiful detail that lets the sparkle and colors of the Cambria materials be showcased. Another great way to keep this new kitchen feeling bright and light is the use of mirror in place of glass in some of the cabinet doors. Two mirrored panels here reflect the window light right across the kitchen and two more narrow panels flank the kitchen sink area on the wall opposite it. Of course our Diode LED undercabinet lighting is a low-profile, low-voltage way of adding light to any project with us. Reflected in the mirrors is the ceiling centerpiece of the new kitchen, a stunning semi- flushmount drum fixture by Kichler. This fabric drum shade is haloed by a cage of detail and from Kichler’s “Jardine” series. Crystals and botanical-inspired metal designs truly steal the attention of any arriving guest. Talk about another material match! Check out how perfectly the new custom window treatments look when paired with this light! This is exactly why it can be so important to work with a one-stop-shop like Village Home Stores. Your entire project vision can be seen by a team of experts, each from their own department to help you select the perfect items for your budget and the overall vision of the space. 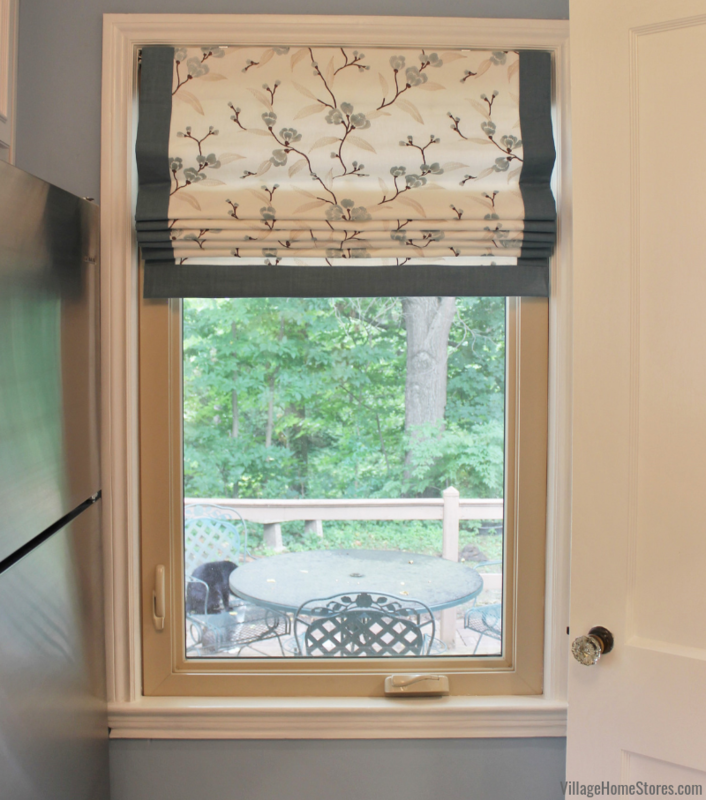 Two fabric roman shades were installed in the new kitchen. 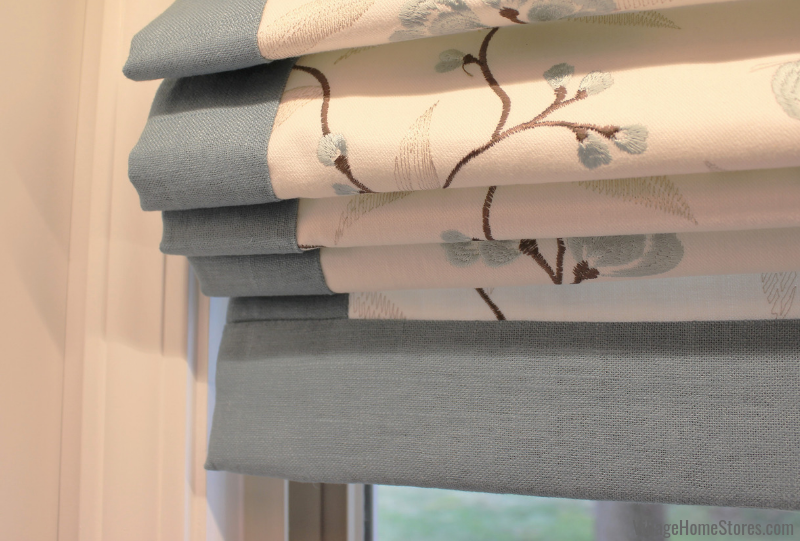 Each using the “Jazz Blue/Cream” fabric and the innovative ONEcontrol cordless system from our Horizon Window Fashions line. Cordless window treatments are a great investment for your space. They are functional and safe plus they look great! 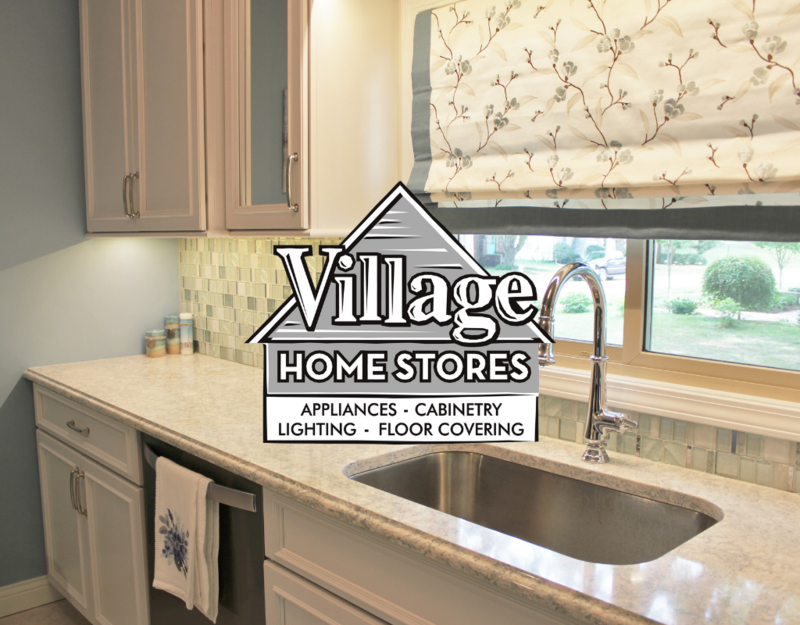 Our window treatment experts at Village Home Stores offer a variety of window blinds and shades in many styles and colors. We even have professional installers to put the product in place for you. 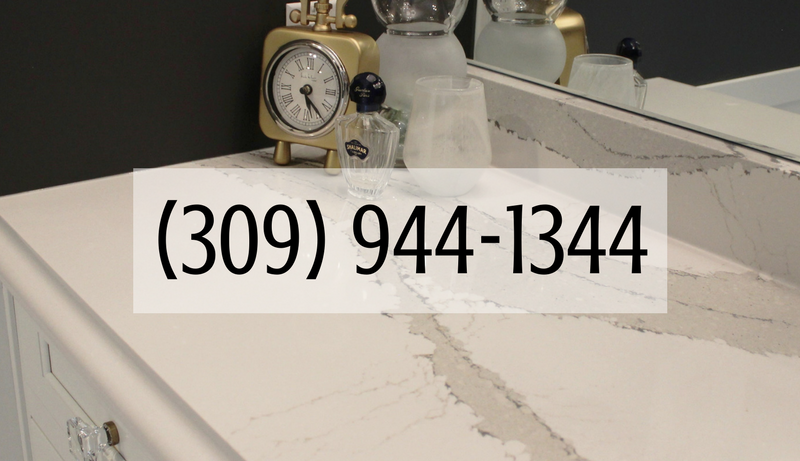 Request a quote for your own project today! If you love the look of these beach-inspired materials or saw an idea you want to save for your own future project, be sure to check our the full album of images. You can find them all here on our award-winning houzz page. 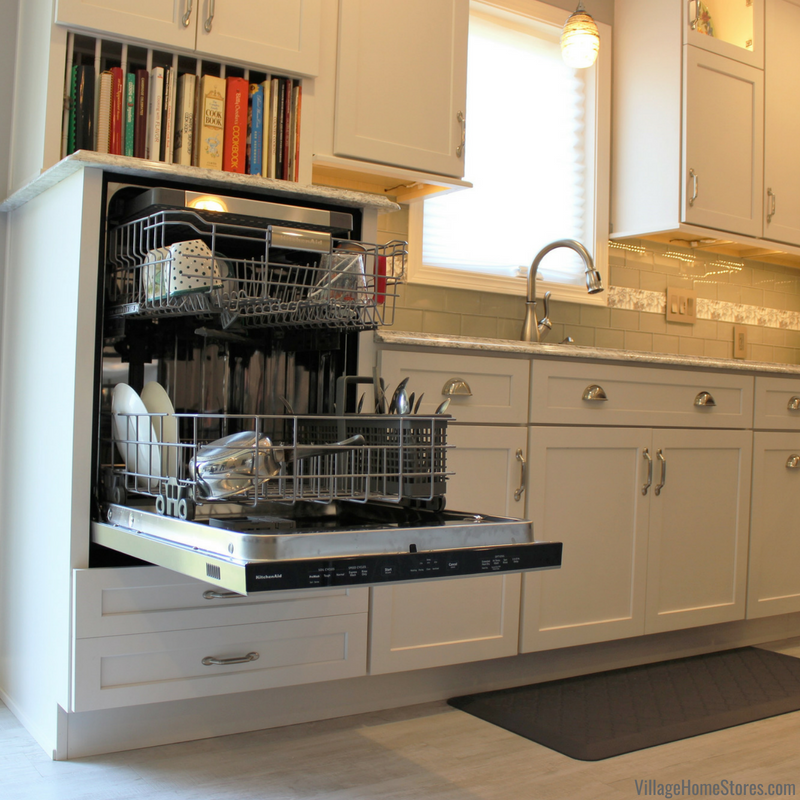 A new feature to this kitchen is probably one of the favorites for the homeowner… a dishwasher! Creating enough space on the sink wall to include a full-sized dishwasher is a game-changer for function in the new design. 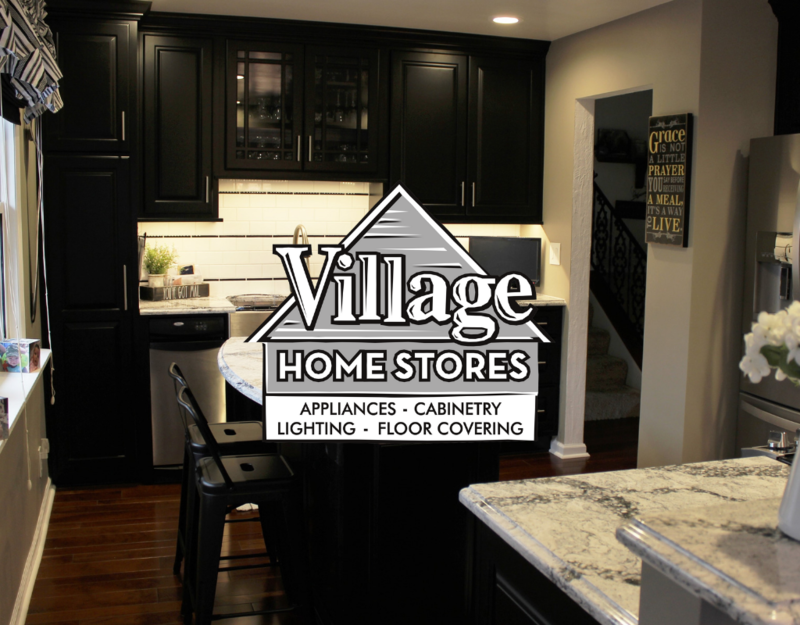 Ready to start the conversation about your own before and after story with Village Home Stores? Your first step is to reach out to our team. Stop by our store at 105 S State in downtown Geneseo, IL or call us at (309) 944-1344 for an appointment. You can also complete this short form online and a member of our team will be in touch about your first appointment with Village. 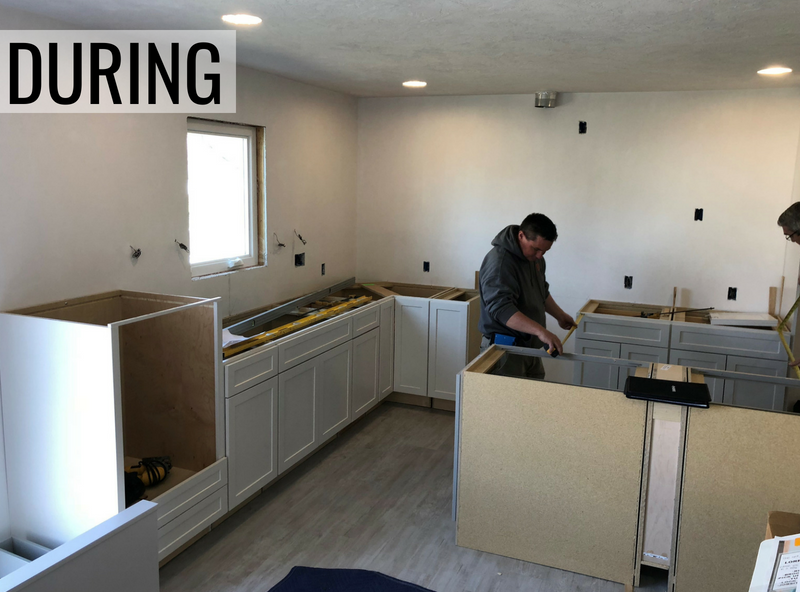 We know that a remodel can be a lot to take on by yourself and that is why we can help as little or as much as you need. 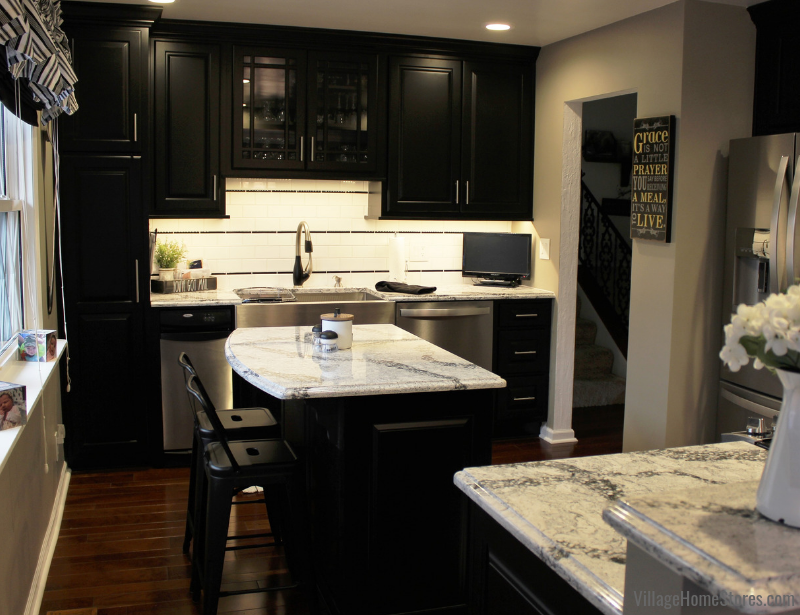 We included this kitchen before and after story in an episode of the Village Home Show. See a full video tour of this space by pressing play. This remodel involved building out an addition to the home of about ten feet in depth and twenty feet in length. The original kitchen was small and very limited in counterspace and storage. Squeezing a small table in the kitchen and having the garage entry right in the kitchen, created a busy and crowded room. We were so thrilled to design a more functional and beautiful space for these sweet customers. Plus we were able to put them at ease with our step-by-step process because Village Home Stores coordinated it all! Estimating, designing, delivery, and installation plus the many subcontractors on site where scheduled by our Project Management team. Our process helps to keep your project on track and on budget. The new kitchen is bright, spacious, and super functional! Instead of the original U-shaped layout with peninsula, the new kitchen is an L-shape with a single-level island and a long section of new storage cabinetry across the room. 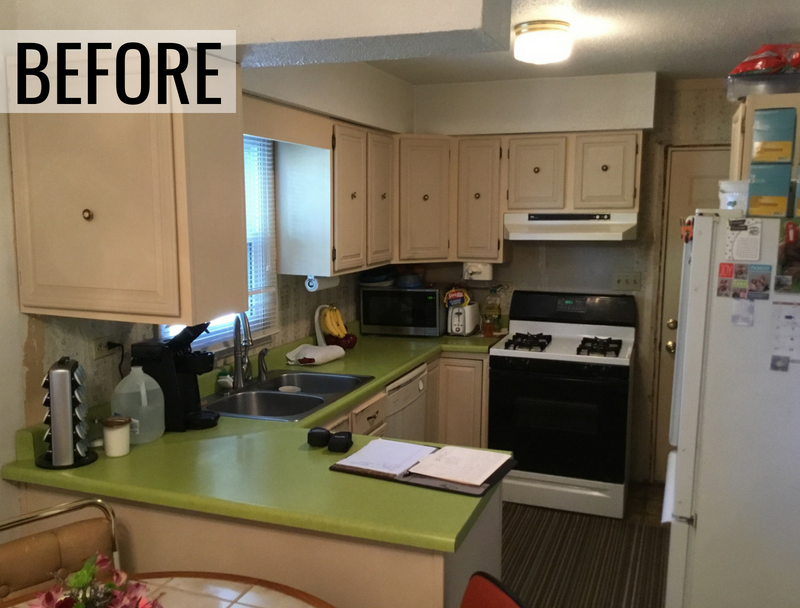 The added space from the home addition helped to transform the small kitchen into a new room that can be used as a kitchen, dining room, drop zone, home office, and even laundry room! That’s right! An incredible home office desk area is just across the room from the new kitchen. A wall-mounted TV and banjo-shaped countertop for a seated desk area helps to use every inch of space available. The light fixture you see hanging above indicates where the new casual dining table will be located. But why TWO tall pantry cabinets for this couple? Well… that’s the laundry room we mentioned! These pantry fronts have been ordered to match the new kitchen but open to reveal a brand new pair of front-load laundry from our Maytag line! 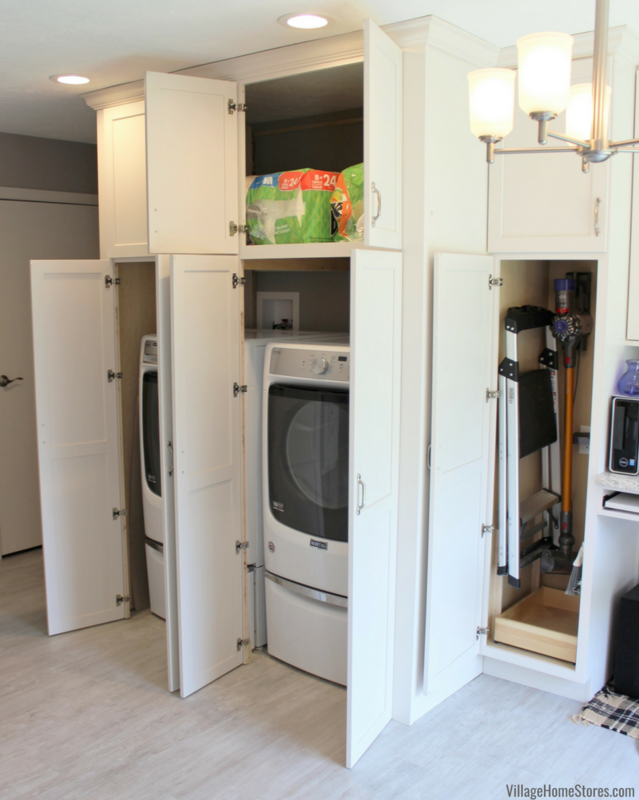 Remodeling to include laundry in a more convenient and accessible area of your home is a fantastic feature anyone at any age or ability can appreciate. Any time you can place laundry in a main level of a home, you create a safer user experience. Plus no bending over or lifting because each unit is installed on top of a raised pedestal for easier loading and unloading. 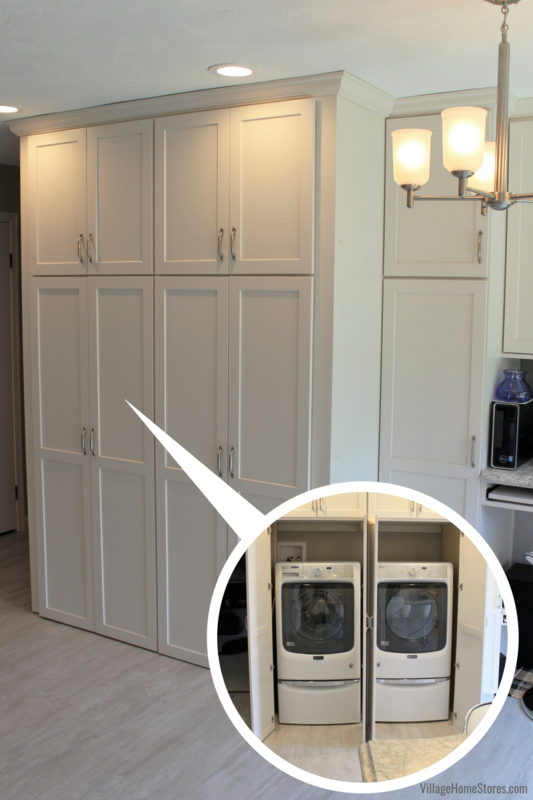 (Pardon the cute dog “photobomb” above in the left corner) So much capacity in the laundry pair plus great storage in this hidden laundry area. 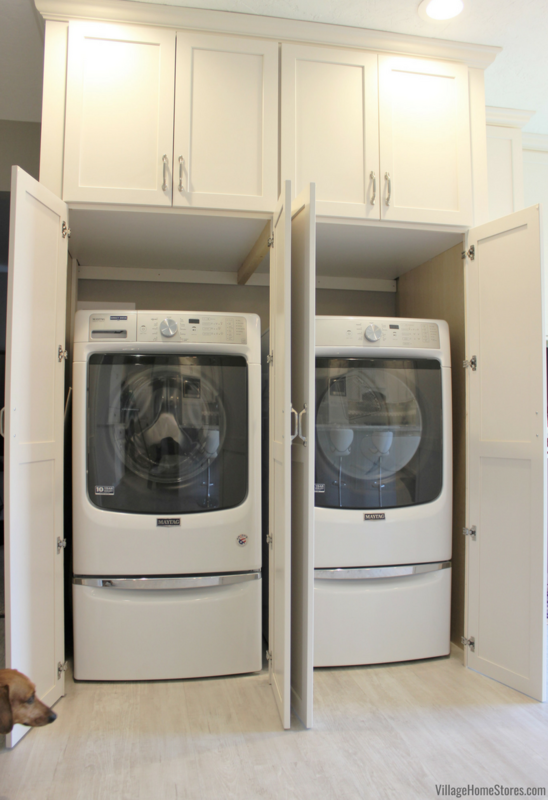 The pedestals are actually drawers that slide open for detergent storage and even small laundry baskets can fit within. Above the laundry are two deep sections of pantry storage perfect for bulk items. There is even a broom closet cabinet between the laundry and desk area. Another age-at-home feature that can be appreciated by users of any age and ability is a raised dishwasher. Who loves to bend down to load an unload a dishwasher? Nobody! Raising it up to a more comfortable height can be a design choice you are thankful for on a daily basis. This KitchenAid dishwasher is super quiet at just 46 dba and even has a third level rack for washing utensils, cutlery, and lids. The cabinetry in this kitchen is from our Dura Supreme line in the Full-Overlay Hudson door and painted “Linen White” finish. The center panels of the hood cabinet have been given a beaded panel to compliment the beaded back of the kitchen island. 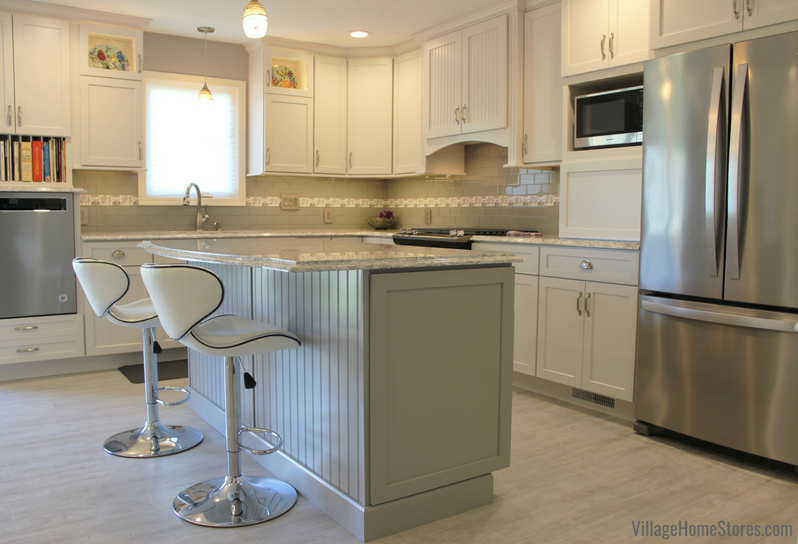 The island cabinetry is painted in a “Zinc” gray finish. Our bestselling Diode LED undercabinet lighting helps to illuminate the new kitchen backsplash and switches and outlets from our stylish Adorne series by legrand. 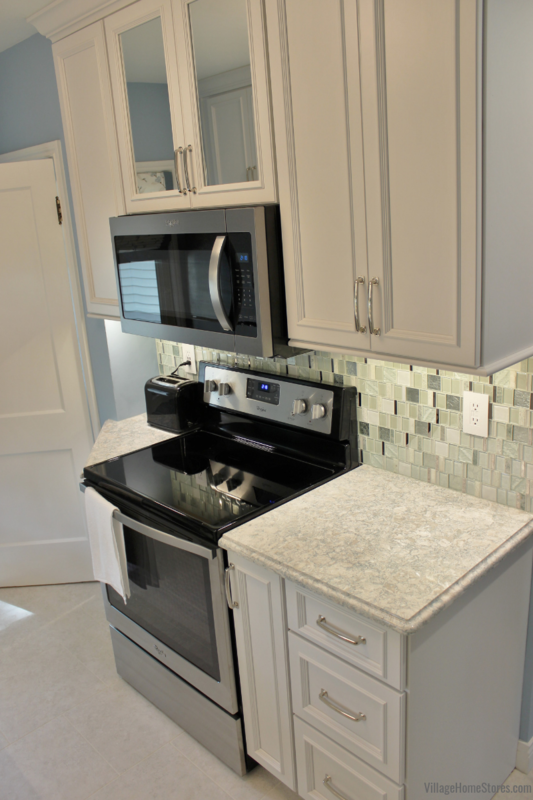 The main tile is a 3×6 subway tile in a brick lay pattern with and accent strip at the center. 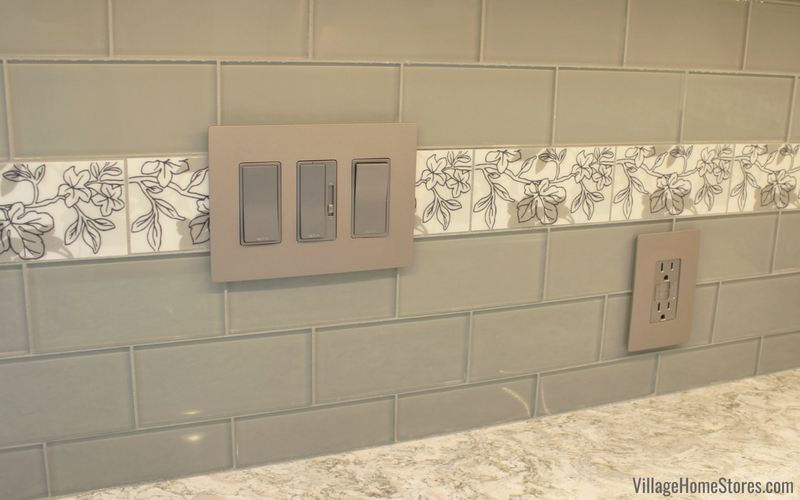 The fun accent tile is by Florida Tile and is Streamline Ivy series in the Shadow Gray color. There is great storage throughout the new kitchen layout. Below is a photo showing our bestselling corner cabinet option, a lazy susan without center pole. Fixed shelves with rotating susan trays allow sturdy access to the full corner. This client has their pots and pans stored right in reach of the new gas range. 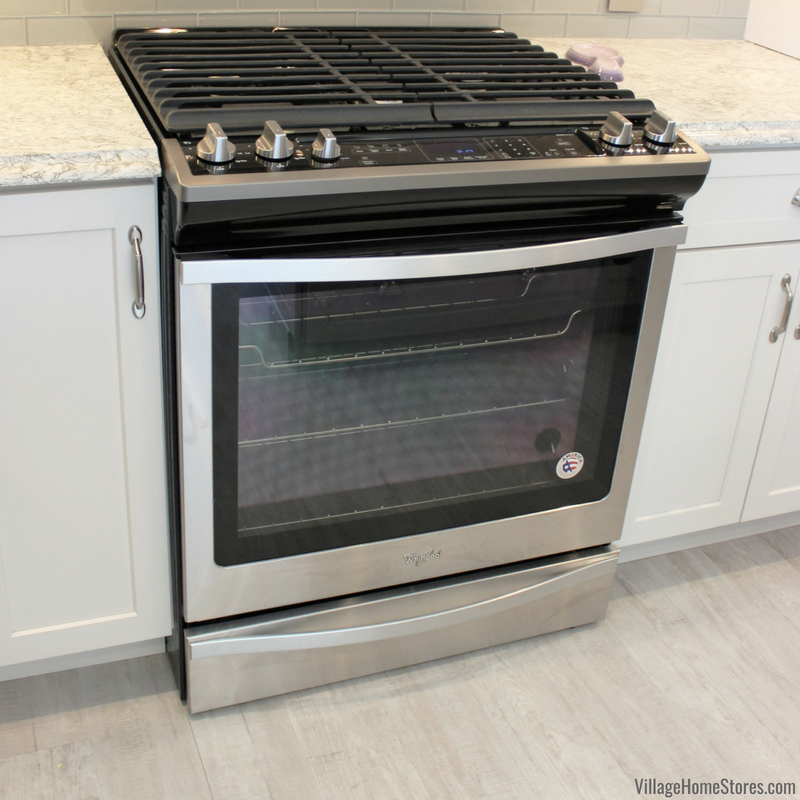 Whirlpool’s front-control gas range is a sleek and functional model. This unit includes convection features and 5.8 cu.ft. of capacity in the oven. The rack systems inside of our ovens have improved so much over the years to help you use the space better. 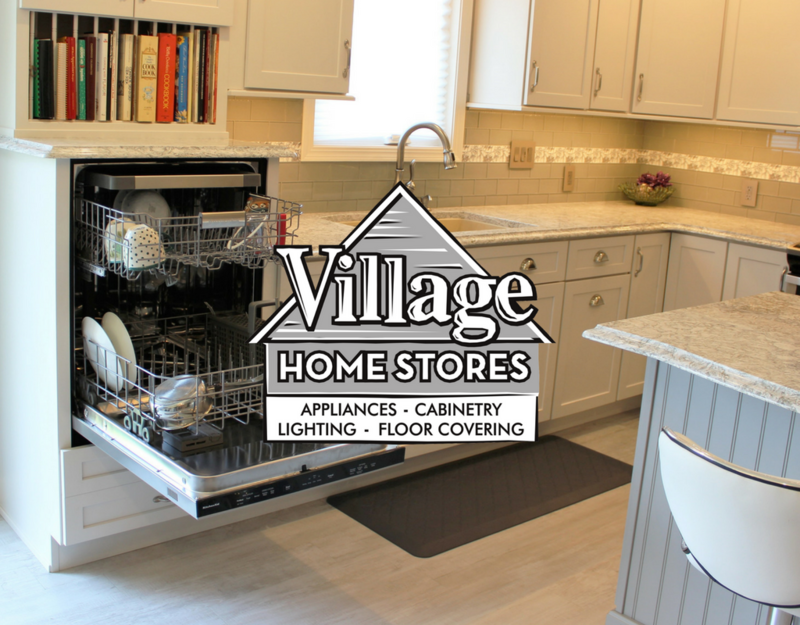 Ask you appliance salesperson at Village Home Stores to show you the inside layout of the range you are shopping with us. You will be surprised at how usable the space can be. 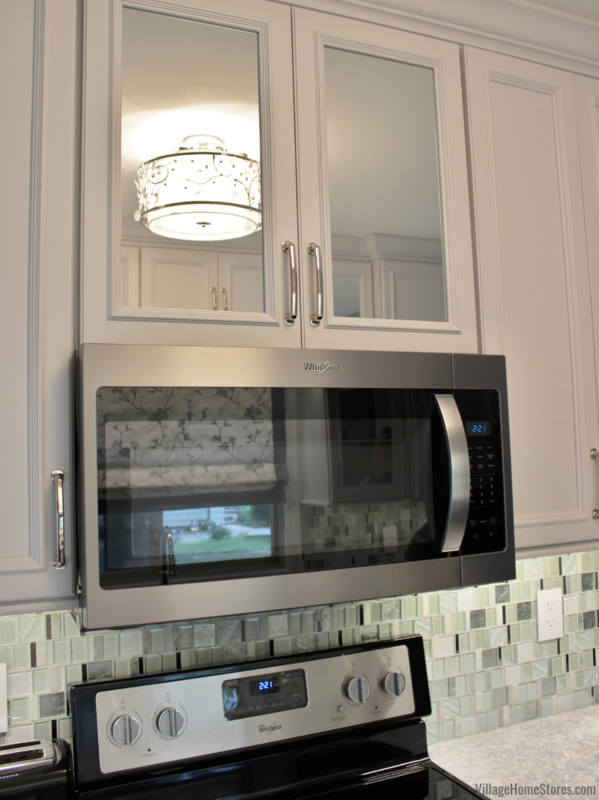 A shelf microwave is placed in a tall cabinet and a wood hood with blower insert is above the new range. Ask your kitchen designer about all of the hood options you have for your new kitchen design. Not everyone has to do a chimney style or microwave hood. We have many options available. 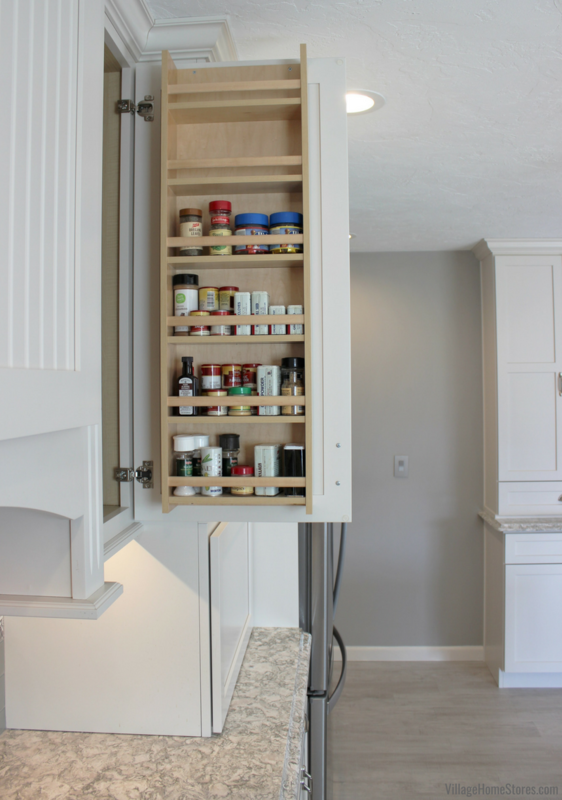 One of our favorite storage cabinets in the new kitchen is a spice rack that can open and be accessed right from the user at the range. Dura Supreme has hundreds of great storage solutions available. 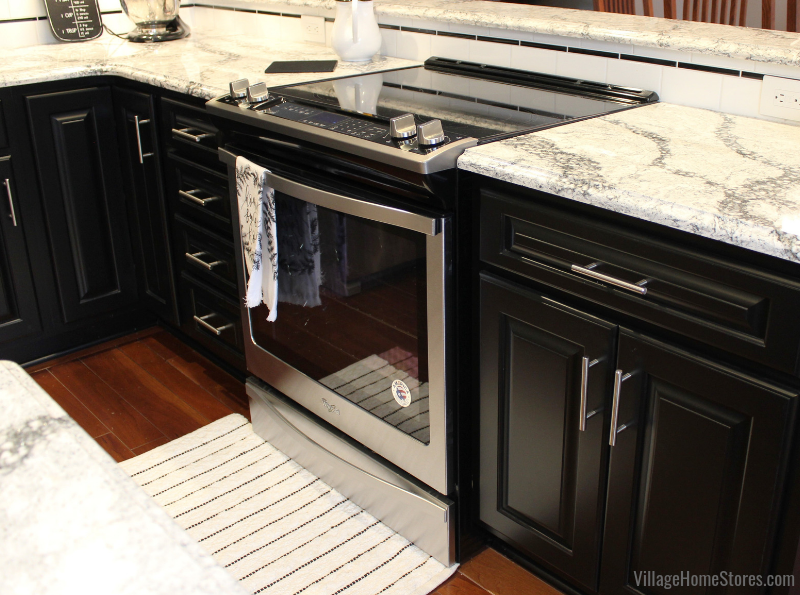 If you have a specific item or small appliances that you want to include as a part of your kitchen design just ask! We can help keep you organized and your counters clear of clutter with a well-planned design. A counter depth refrigerator model is always a great way to keep a kitchen plan open and pathways clear. This french door model from Whirlpool is great with an internal water dispenser and incredible interior shelf storage. 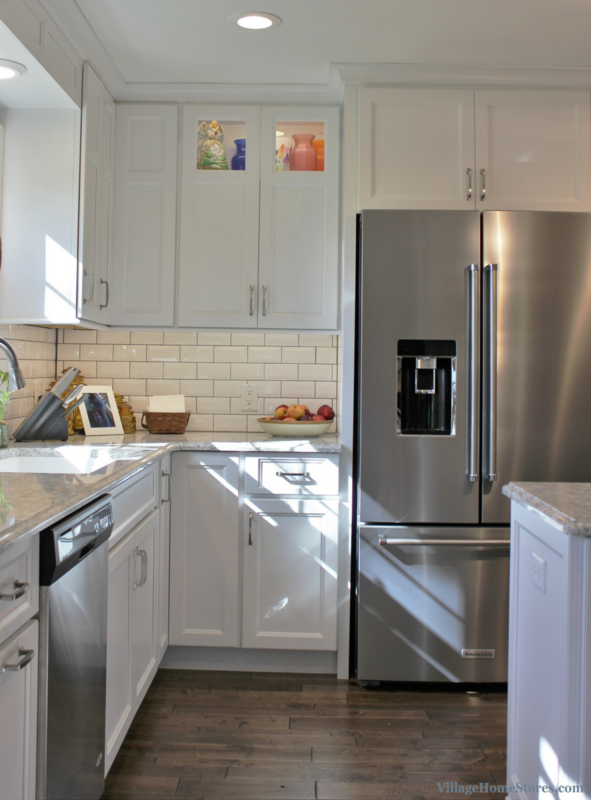 We just love how the Stainless Steel finish looks in this bright white and gray kitchen. 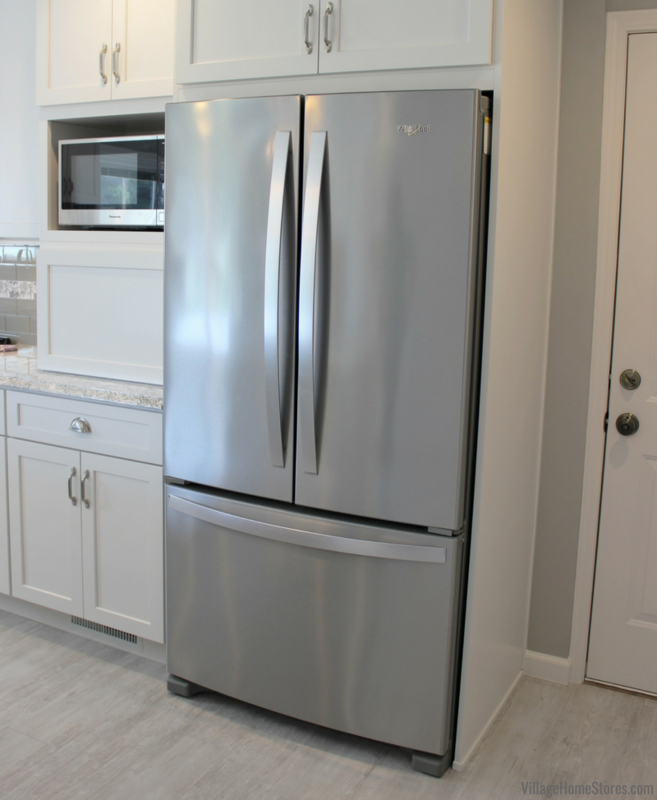 A counter-depth refrigerator model, along with the added space from the room addition allowed us to provide generous pathway allowances between the kitchen counters and the new kitchen island. As you can see below, there is about a 45″ distance in this L-shape of pathway within the kitchen. 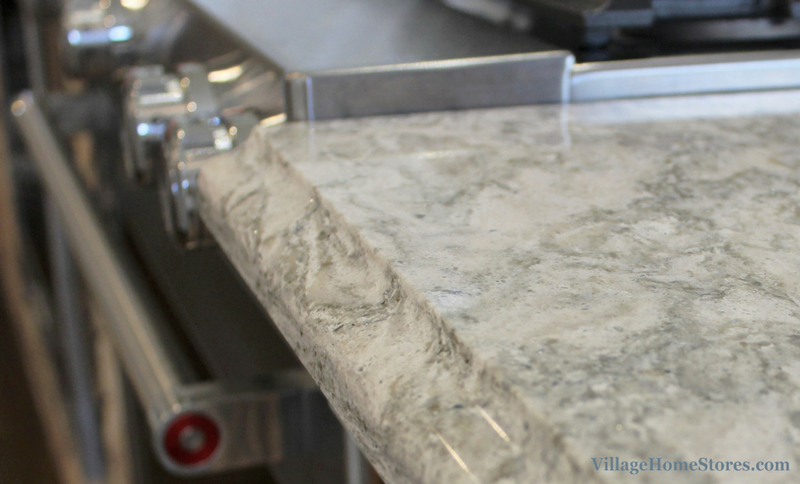 The countertop edge itself adds an element of style to the new kitchen. 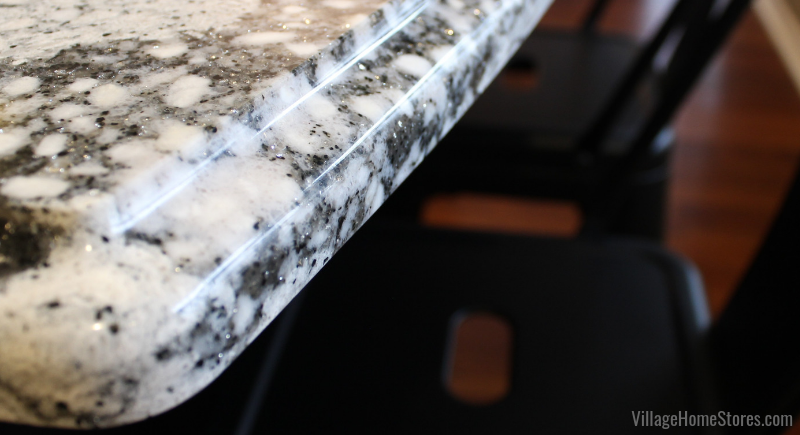 An “Ogee” edge profile has been applied to Cambria Quartz in the Berwyn design. This edge profile is always impressive in person because the light catches the edge as you walk in and around the kitchen. 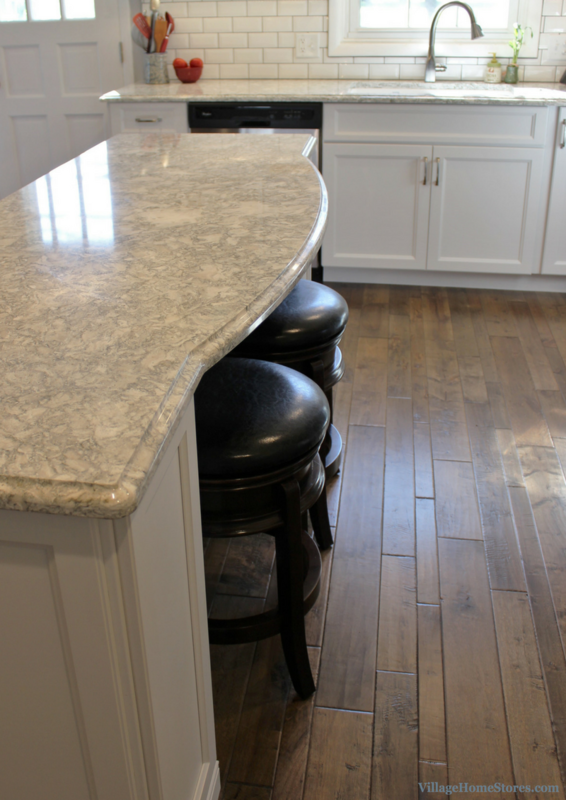 The Ogee edge is a great way to dress up a subtle or neutral colors countertop. 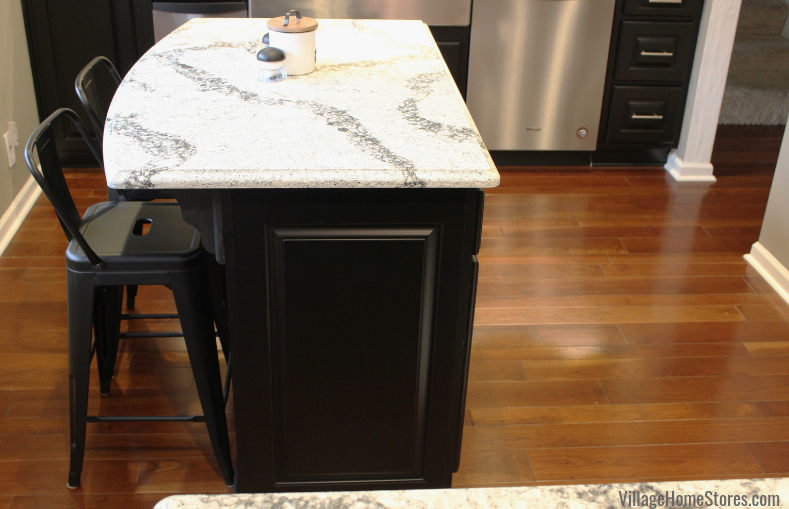 The radius corners and overhang curve of the island top help to soften the look of the space. There is a wonderful new kitchen island in the new design. Plenty of seating on the back side for two plus great storage facing the inside of the kitchen. Two large drawer stacks with some including an adjustable pegboard dish storage interior. 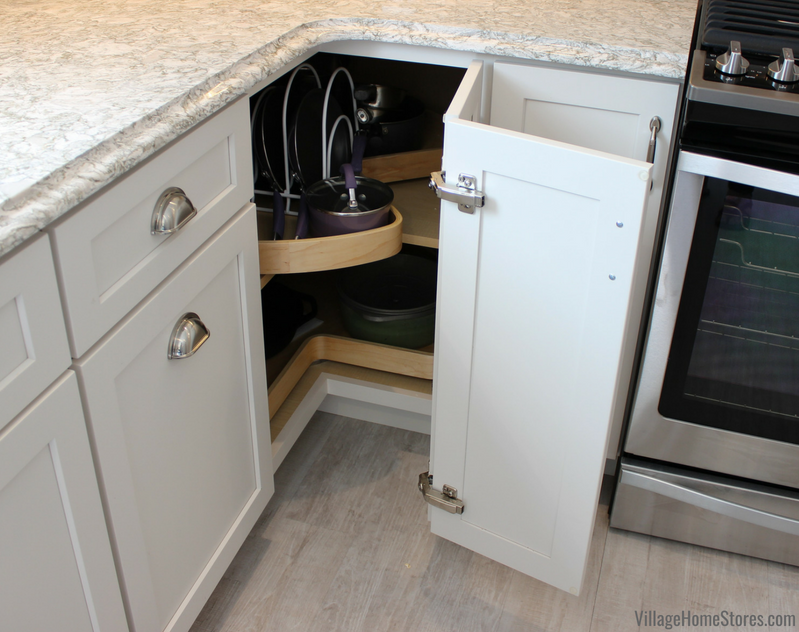 For some, this is a great way to store dishes and bowls. It allows you a more comfortable way to lift up from a drawer and not down from a high wall cabinet. We also included an outlet on the end of the kitchen island. This makes it easier for small appliance use or even plugging in laptops or chargers if a user is seated at the island. Between the two large drawer stacks is a narrow spice drawer cabinet. 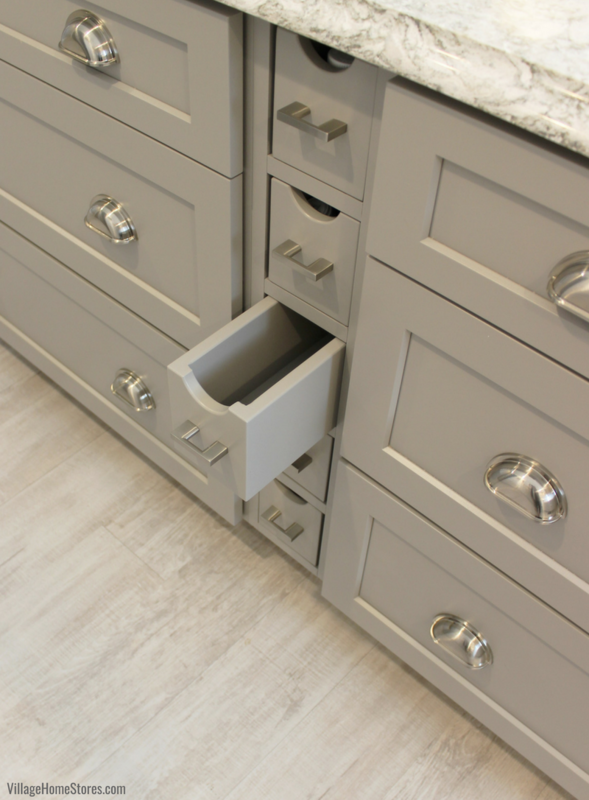 These drawers may look cute and decorative to you but they can be very functional! This client had one dedicated to medications and vitamins and another for toys and goodies for the grandkids. All of these gorgeous new finishes and design changes make life more comfortable for everyone in the home, including these two sweet pups. They love their new Permastone luxury vinyl flooring from our Tarkett line. 6 x 48″ planks in the Tundra finish are perfect for laying in a sunbeam and watching birds and wildlife outside their new sliding glass door. If you love this blog tour then be sure to check out the full album of photos from this project here on our award-winning Houzz page. Plus be sure to tune in for the Village Home Show Sunday mornings at 9am on WQAD in the Quad Cities region. You will see this kitchen among many other beautiful before and after stories local to you. 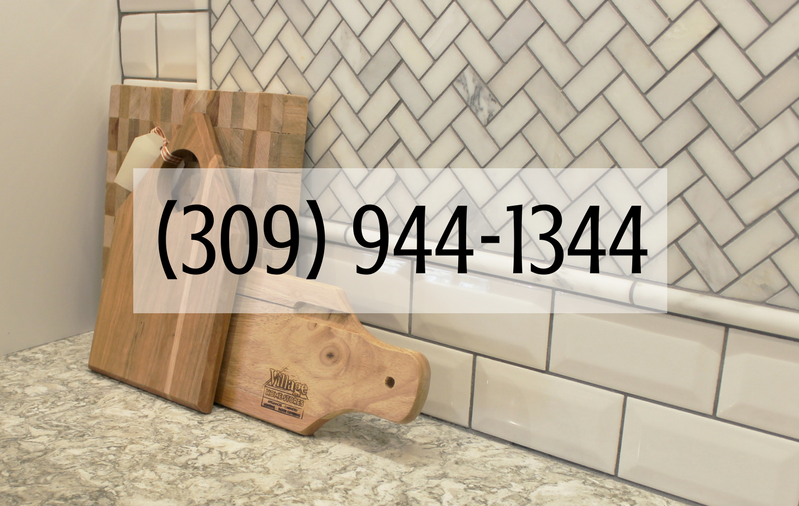 If you are ready to start the conversation about your own remodel transformation from our store, your first step is to just reach out to us. Call us at 309-944-1344 or complete this short online form and a member of our team will reach out to you. 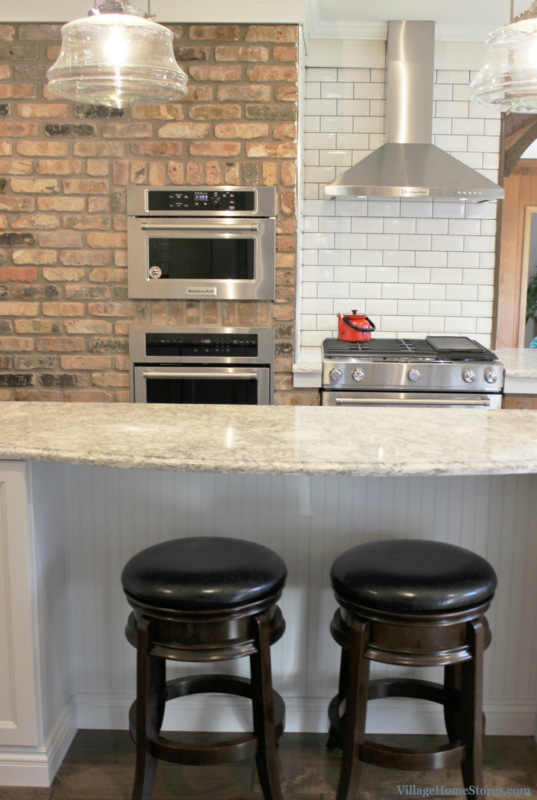 We recently finished a full kitchen remodel at this ranch home in Atkinson, IL. 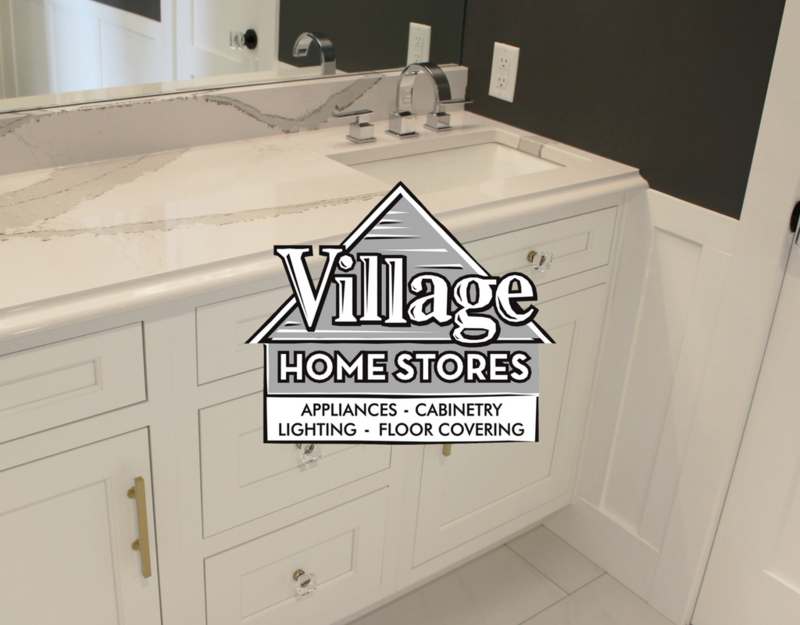 The entire process was managed from start to finish by the Complete Project Management Program at Village Home Stores. This means that we managed the entire process from early on in the bidding and designing phases, through the final project walk-through. Take a look at this beautiful and bright new kitchen! Of course this space didn’t start out giving out such bright and spacious feelings to guests and users. It began as an open but dated kitchen. Unique traits such as the wall ovens in a brick wall helped to give it an edge. 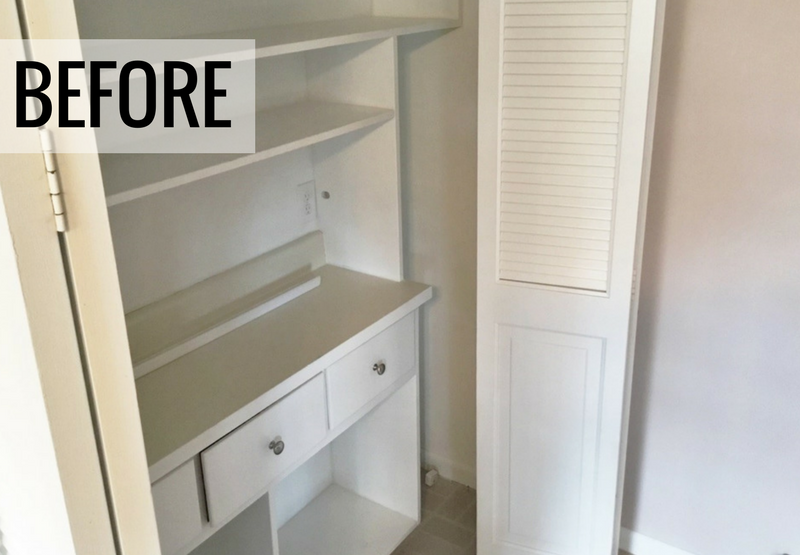 With a new homeowner in 2017 came the opportunity to update and upgrade this space. Don’t worry we kept that brick! We did make quite a few upgrades in layout and materials throughout the rest of the space. 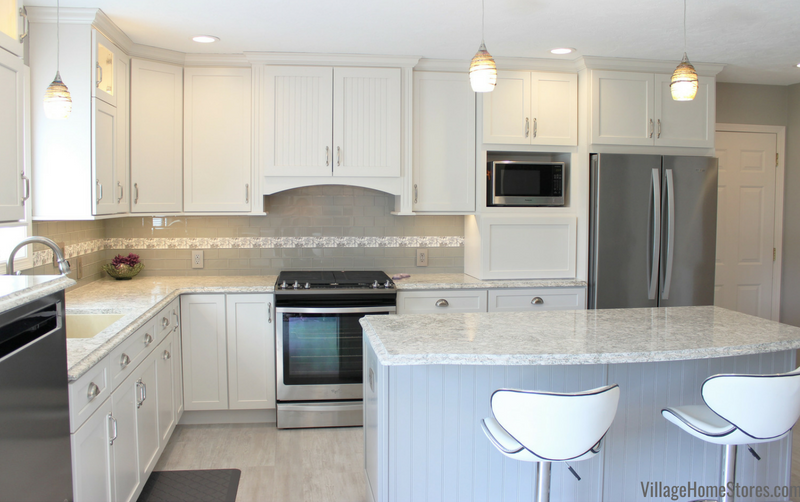 This kitchen has gone from a medium-toned wood to a bright painted white. That change alone transforms the look and feel of the kitchen for guests and users. One upgrade we should begin with is that this is now a kitchen that includes 4 ovens…wait what?!?! Yes FOUR OVENS! Allow us to walk you through a tour of the new cooking center in the kitchen. 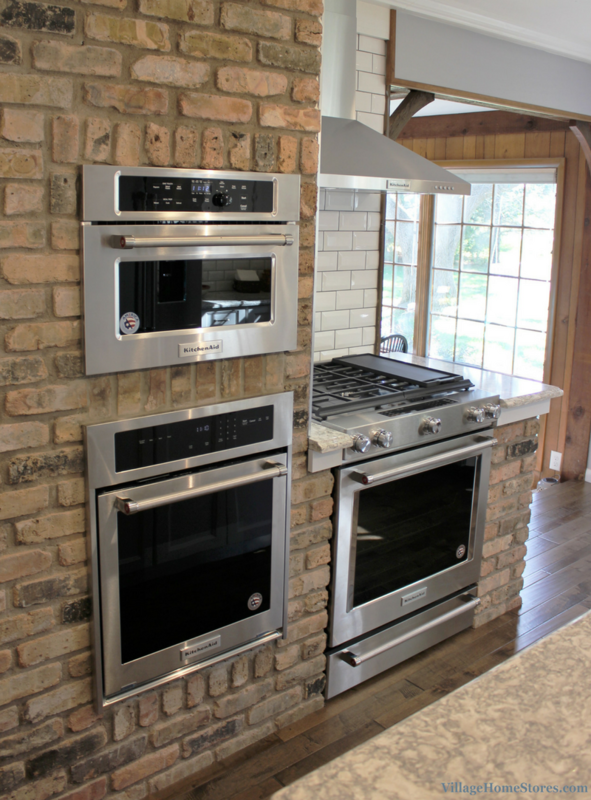 A 24″ single wall oven, 24″ combination microwave/wall oven, and a slide-in gas range that includes a lower baking drawer. That offers all the convenience of each of the units for day-to-day use and lifestyle. But for those few times every year when entertaining, this KitchenAid® package offers 4 ovens all can be used at 4 different temperatures! Many times our customers are drawn to a slide-in model of a range for the look and integration into a clean new kitchen design it allows. KitchenAid® has made such incredible changes to these sleek new models by including many features and benefits that were once reserved for their larger, more commercial style units. One new innovative feature we must mention is the shift from a “warming drawer” to the new baking drawer. Yes you can still set it on a “keep warm” function or even store your baking sheets in it when not in use. 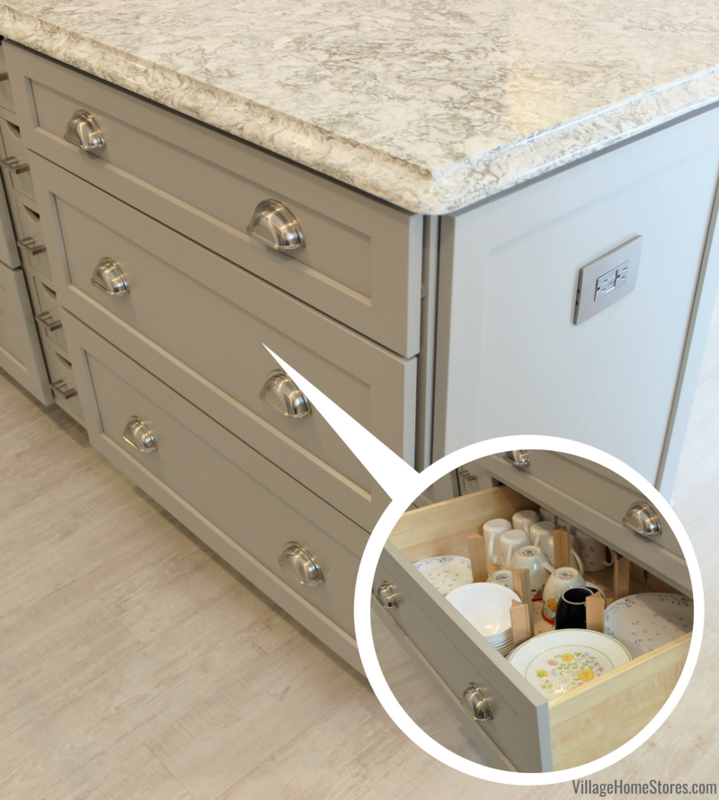 However, new changes as to how you select the setting of this drawer have opened up the opportunity to now use this space to bake or slow-cook items at a different temperature from the main oven area. All of these great features PLUS convection in the oven in a 30″ model! With all of this talk of baking temperatures and capacity we don’t want to breeze over the fact that the gas cooktop on this model is enviable as well! 5 burners that collectively range from 5,000-19,000 BTU’s. That allows you to shift from a rolling boil to a very low simmer almost immediately. 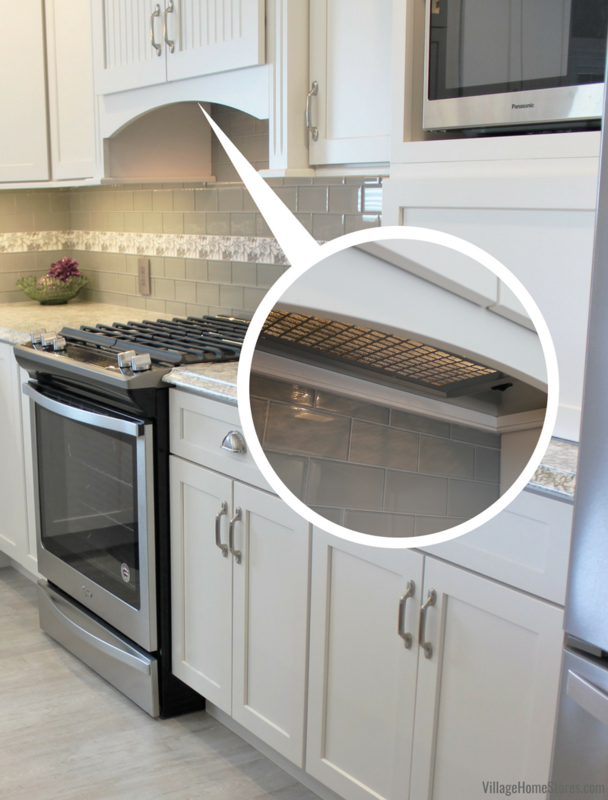 Above the cooktop we have installed a wall-mount 30″ canopy hood in Stainless Steel. This hood has been fit with a re-circulation kit. We would classify this kitchen as a great example of what New Traditional is becoming in the Midwest region. A smart working layout and durable materials with clean lines help to keep a kitchen functional and beautiful. 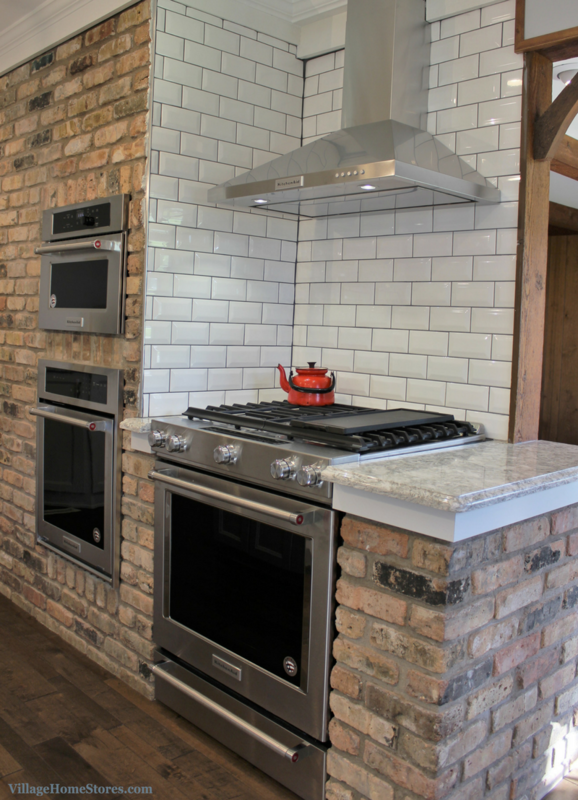 New Traditonal is also about including great textures (hello brick) and adding historic details like the schoolhouse shaped pendants used here. 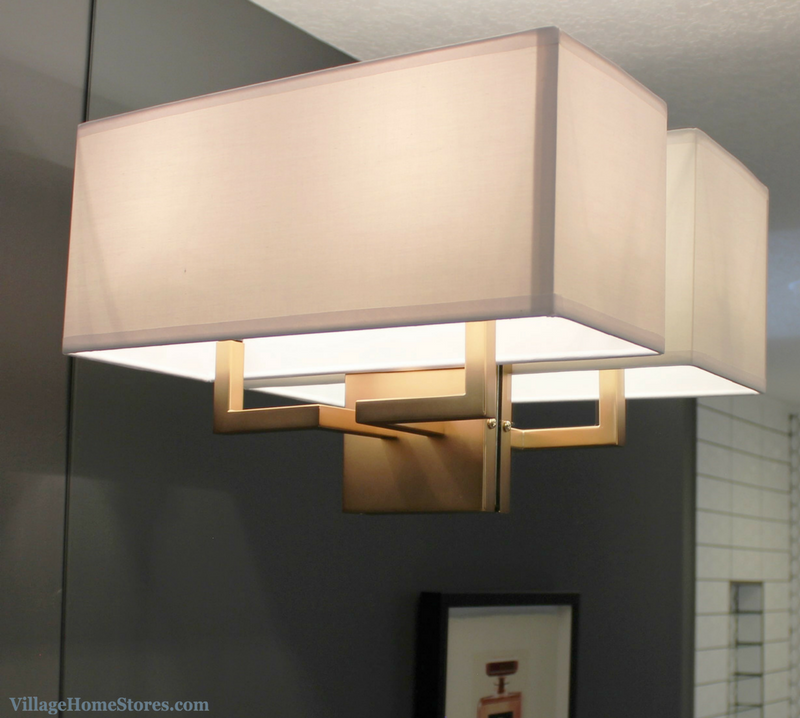 We love that these “Garvey” pendants by Savoy House allow light out of the fixture and also through. Using clear glass here helps to keep the space more open and bright. The shape does lend itself to that old world look and adds style. The metal finish of the fixtures also helps reflect light and compliments the Stainless Appliances without duplicating it. 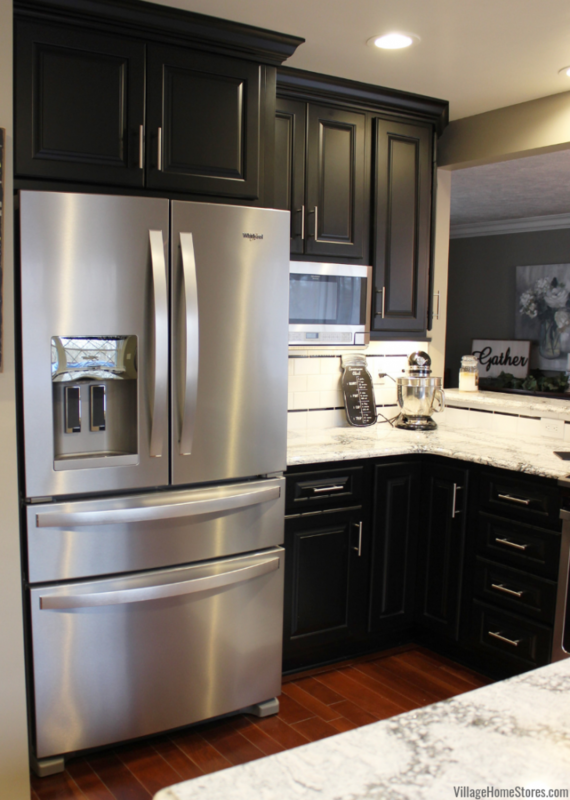 We realize we jumped right into an appliance tour without showcasing the new kitchen itself. An L-shaped kitchen design with a large single-level island fills the kitchen with storage and surfaces that are usable and accessible. The arch of the countertop at the center offers up an overhang space for the island seating. 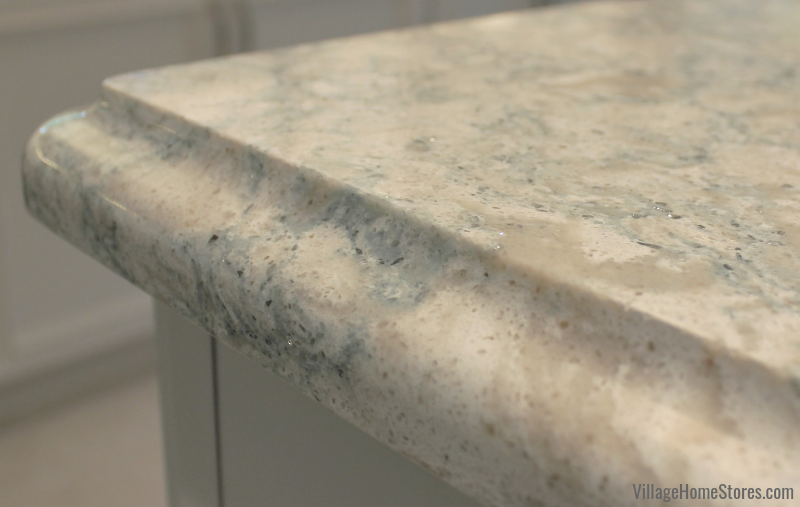 Cambria® Quartz counters in the “Berwyn” design have been installed in a stylish “Ogee” edge profile. This decorative edge looks right at home in this space. With such a bright room and material selection, the light hits the edges of the Ogee detail and really helps to showcase the quartz color and details like that arched island top. 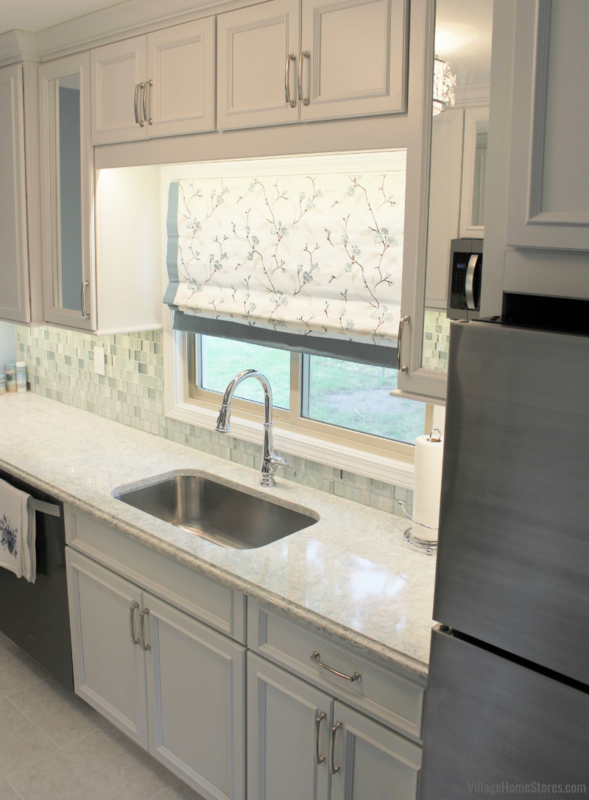 Quartz is a fantastic choice for a countertop investment. Once installed it is maintenance free and will look as gorgeous 15 years from now as it does today in these photos. With so many designs and edges to select from, you can almost certainly find something for any space. The usable space of the kitchen now seems like a larger area even though we didn’t open up or remove any walls. In fact we added to the cabinetry in the new kitchen design. On the opposite end of the kitchen used to sit a closet pantry area behind bi-fold doors. Now that pantry area has become a built-in hutch and sideboard part of the new kitchen design. Still a location for great storage, there is plenty of shelf space above plus deep base cabinets with roll-out shelves below. An open counter area now allows this area to be used for serving while entertaining. Imagine it set up as a drink station during holiday get-togethers. As you look at the above and below images it is very clear that the best way to showcase an area like this in your project continues to be our Diode LED lighting system. Keep in mind these photos were taken during the day. Even so, the lighting is what takes all of this design and material to the next level. What good is it to invest is such beautiful products if you can’t see them? 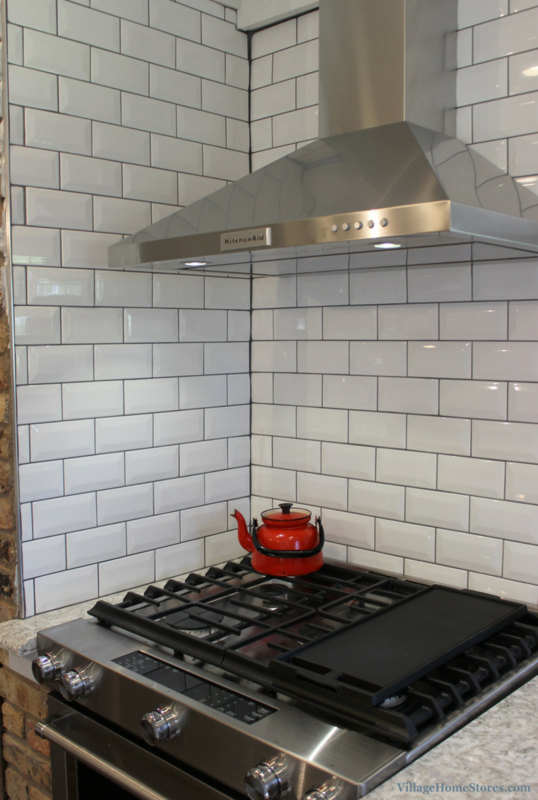 There is a beveled subway tile throughout the new kitchen from our Rittenhouse Series. The color is “Arctic White Gloss”. It is important to note a very updated look to the classic subway tile of the past: gray grout. 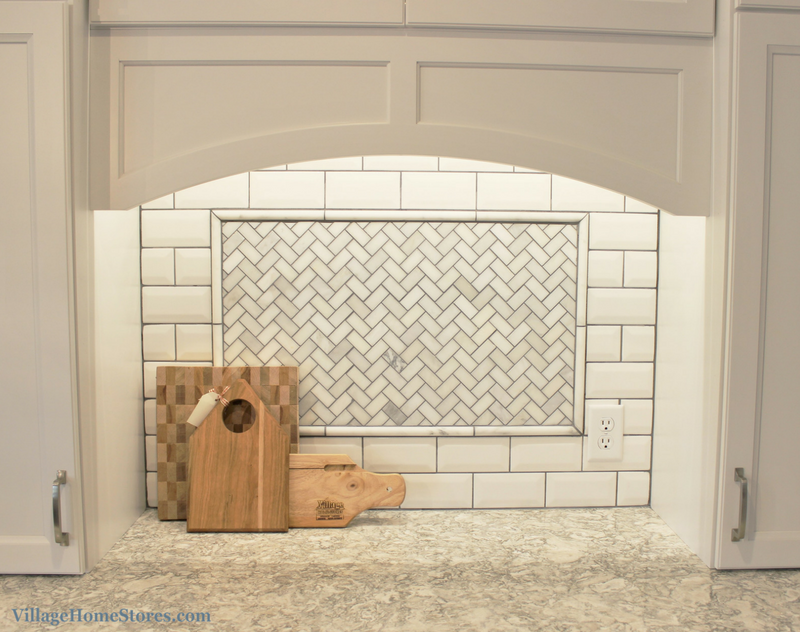 White subway tile with a gray grout installation is such a great look. It is a new approach to an old look and we continue to love every job we get to install with it. 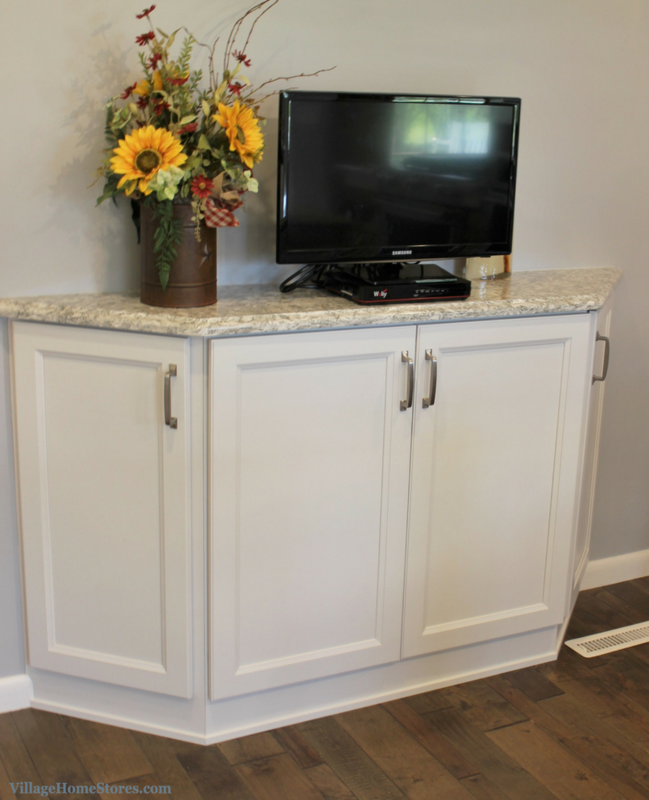 Another area that we added cabinetry to is an angled, shallow cabinet section designed for a TV on an open wall. Just enough of a counter space for a flatscreen but look at all that added storage below! The cabinetry in the kitchen is from our Koch Classic line. The doorstyle is named “Bristol” on a paint-grade maple. This flat-panel door works well for may styles and tastes. This kitchen it was ordered with 5-piece drawer fronts and a decorative outside edge applied to the doors and drawers. 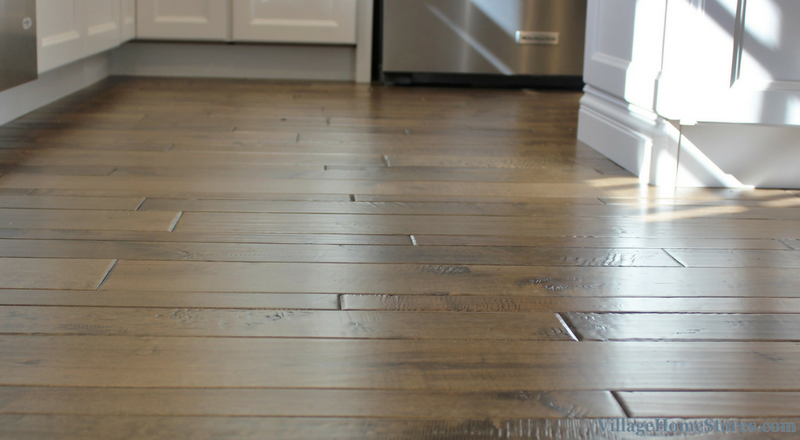 In a bold contrast to the white painted cabinets is the beautiful new hardwood flooring beneath everything. Random widths of 3/4″ thick maple from our Bella Cera Alessandria series is finished in the “Padua” finish. A painted white kitchen always helps to make a space seem larger and more brighter both day and night. The light catches the texture and varied widths so beautifully. 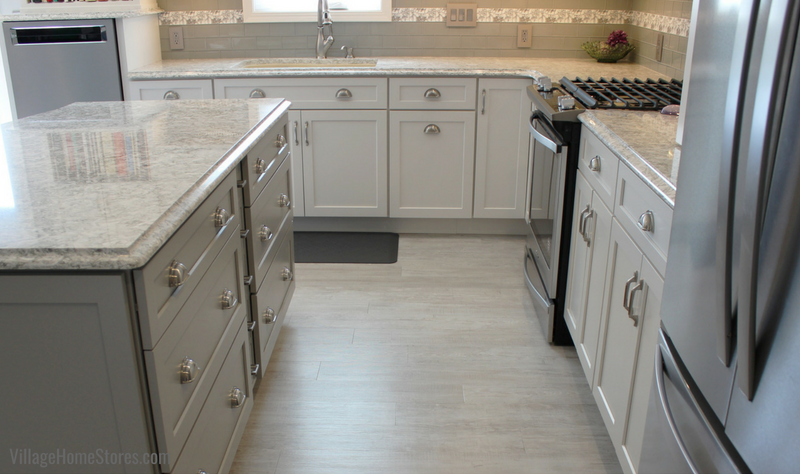 See the full album of photos from this kitchen here on our Houzz page. Bright white cabinets that reach all the way to the ceiling. We have found that sentence to be so common when we ask our clients what their dream kitchen looks like. The great news is that look can be interpreted in so many styles and budgets. Here it looks right at home paired with coved crown molding and with top sections cut for glass creating a clerestory look. Are you ready to start the conversation about your own before and after story with Village Home Stores? It begins with you simply reaching out to us. We will walk you through all of our processes to find out which project path works best for your home. Whether you want to do most of the work yourself, or need all the help we can offer. We are here to help. Call us at (309) 944-1344 or complete this online form. We can’t wait to hear what you are working on! 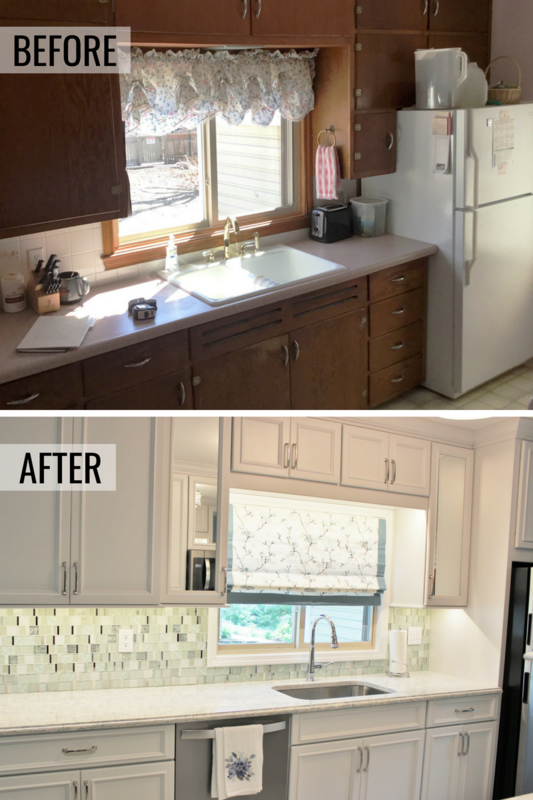 In our last feature post we shared a tour of a stylish and sophisticated kitchen remodel. That same home in Coal Valley, IL also includes a remodeled Master Suite area just as stunning! 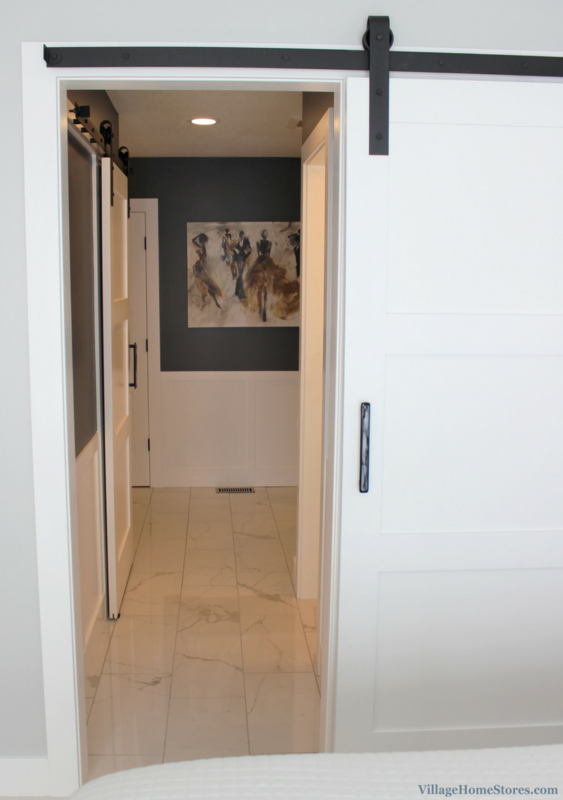 A sliding barn door in the Master Bath opens to reveal a walk-in closet, makeup vanity room, and a beautiful bathroom space. 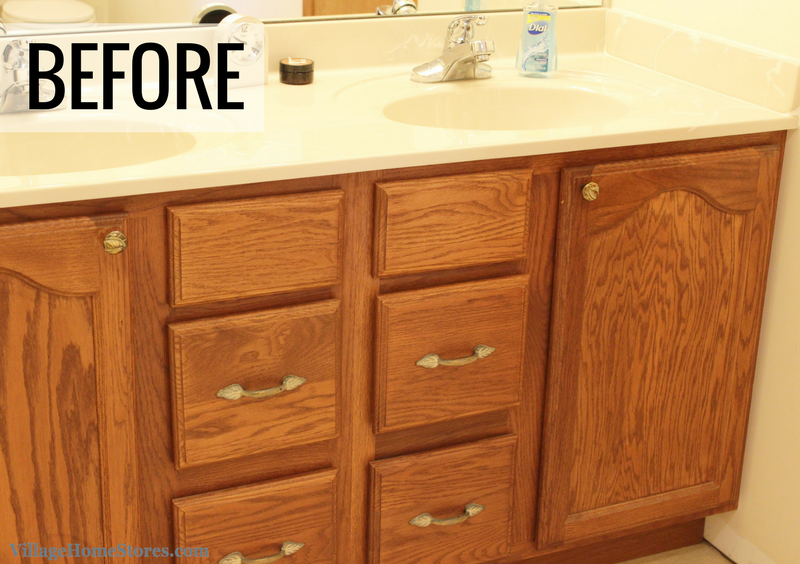 Just like the kitchen, this bathroom began in a beige setting with a medium Oak vanity. A wall-to-wall installation of vanity and top included a cultured marble vanity top with two integrated bowls. 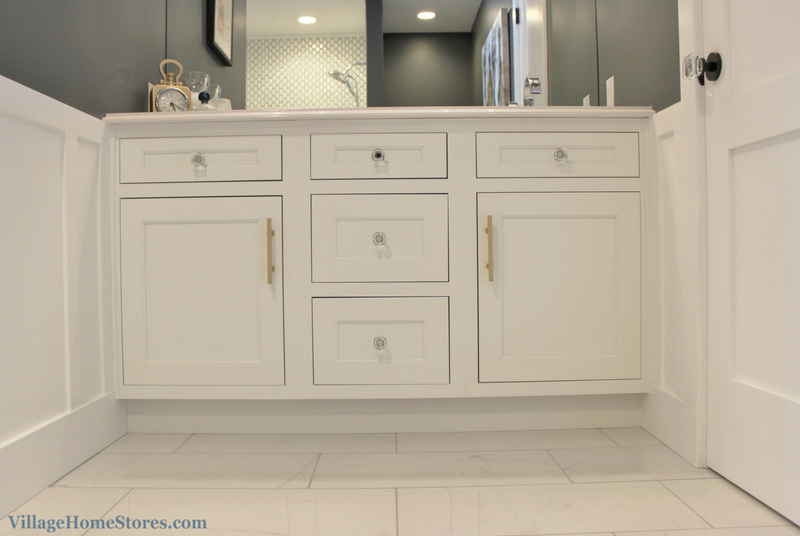 The new vanity area now includes an inset White painted vanity from our Dura Supreme line. The “Highland” doorstyle is inset into the vanity face frame for a classic and stylish look. 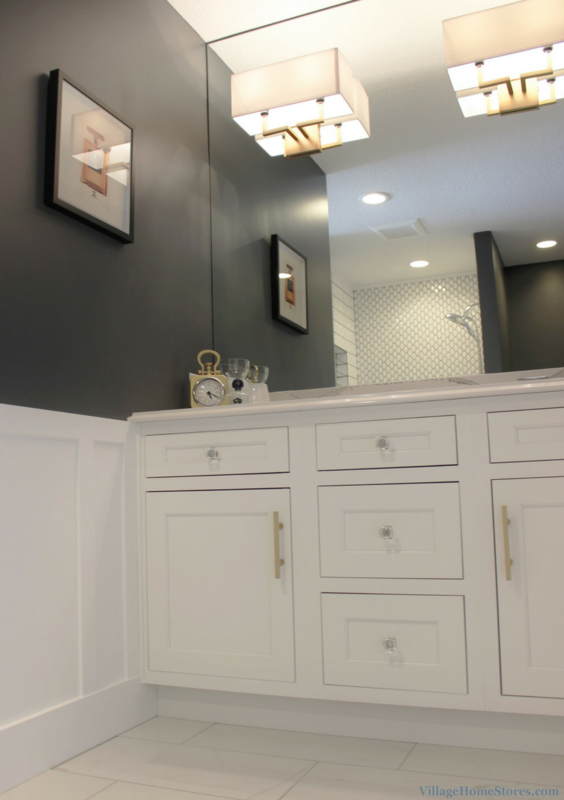 White wall paneling has been installed throughout the new bathroom and is divided up to create shapely pattern. Shapes and shadows are truly the centerpiece to the details in this Master Bath. 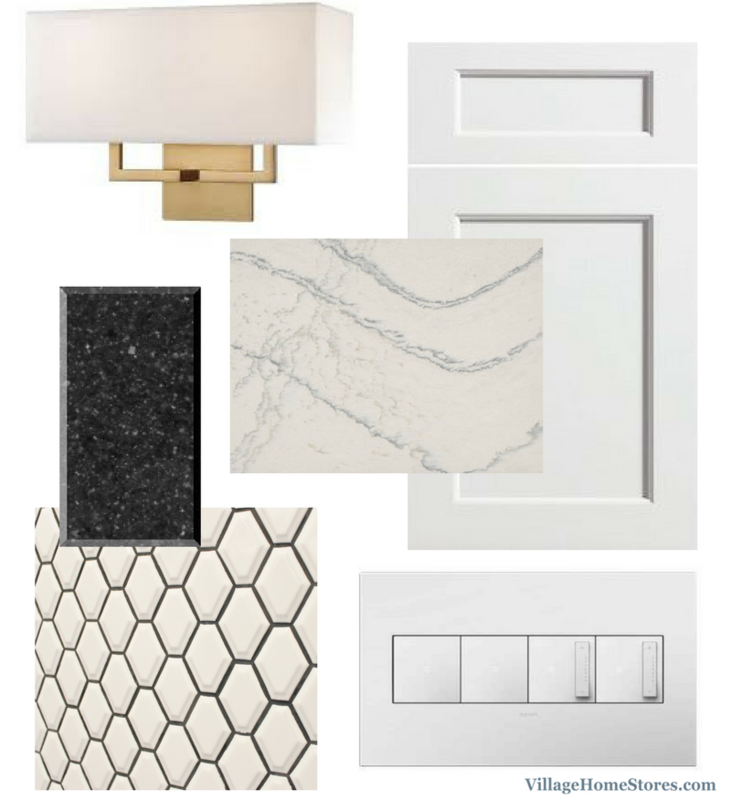 From the inset door edges, to the unique wall sconces, everything makes a statement. We love that the accents of gold from the other areas of the home have made it into this Master Suite. 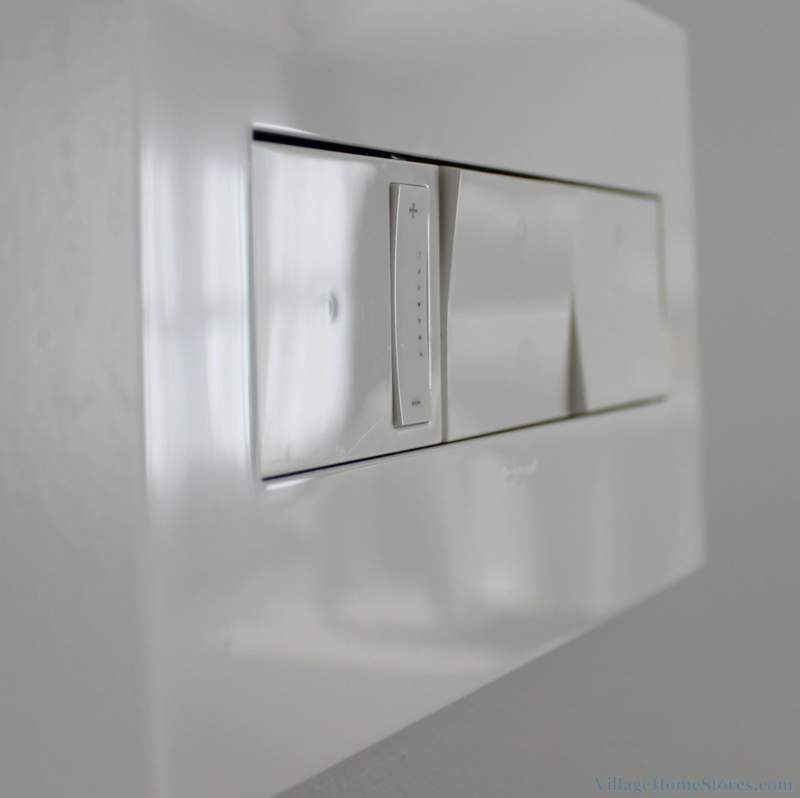 The wall sconces are mounted directly through the wall-to-wall mirror. This helps keep the bathroom space seem more open and airy by having the maximum amount of mirror available to bounce and reflect light around. 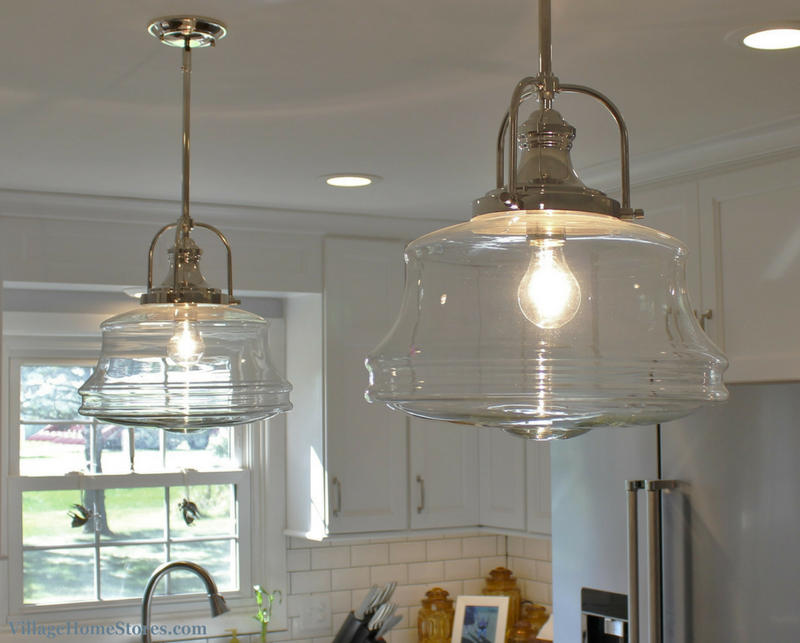 These 2-light fixtures are from the George Kovacs collection by Minka. The Honey Gold finish and white fabric shade are right in place with the rest of the materials selected. The squared off corners of the gold frame reflect and create an almost greek key design. 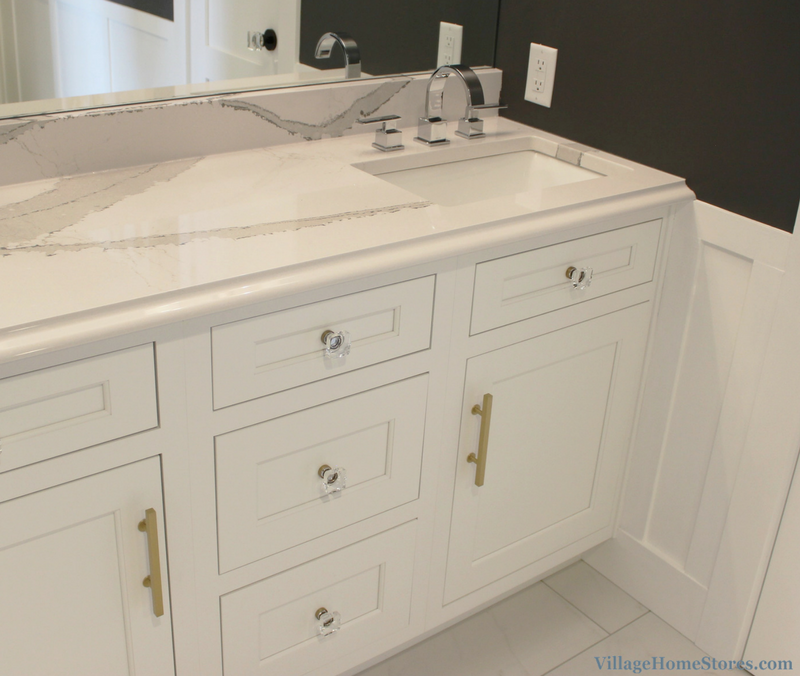 Beneath the mirror and sconces sits a gorgeous new vanity top. Instead of a double bowl vanity, a single offset layout has been installed. 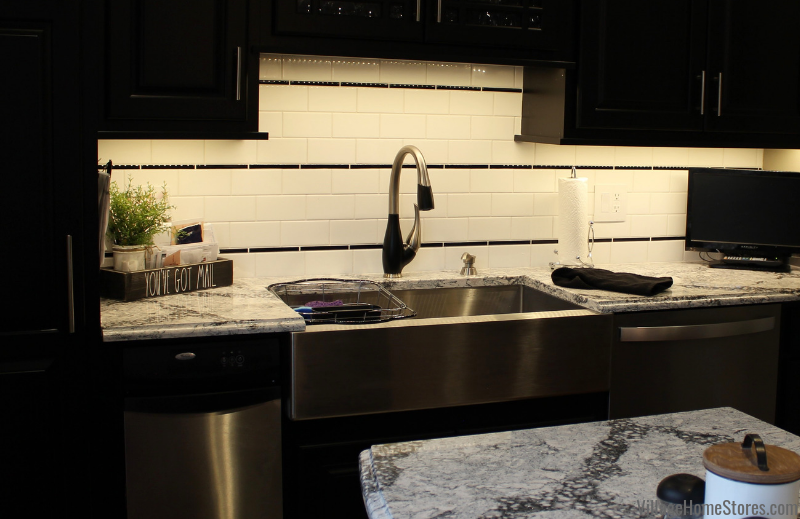 This allows for more countertop space and allows the pattern of Cambria® Quartz “Brittanicca” to take center stage. A clean and stylish blend of whites and grays, this quartz has a natural marble look with the maintenance-free perks Cambria® offers. The vanity top has a “Large Ogee Edge” applied. With a vanity area that stunning how could a shower still grab your attention? Well… we removed the shower curtain to take a few photos so you can get the full wow-factor! We were correct about that wow-factor weren’t we? 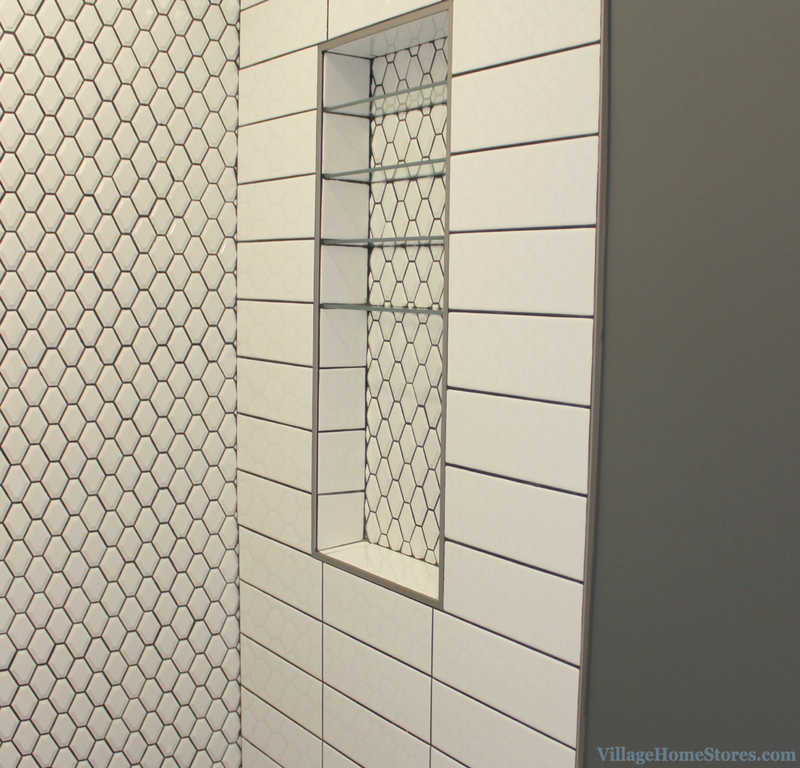 Using a dark gray grout here helps to enhance the geometric pattern of the tile installation. This tile by Florida Tile is appropriately named “Hex” is a glossy white hexagon pattern. Proof that you do not need a mosaic of colors to make a bold statement with tile, this shower is amazing! 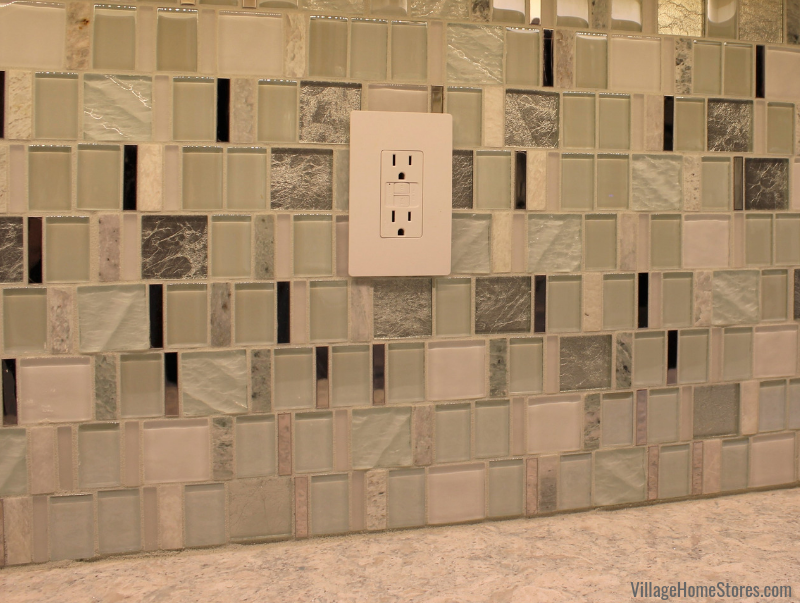 A mix of two shapes of the same colored tile installed in a modern look. We love the stacked install on these long, horizontal tiles. One the wall opposite the shower head is a custom tiled niche area. Inside of that niche the same “Hex” tile has been used and glass shelves allow light to pass through. Including a custom shelf or niche is always helpful when planning a tiled shower. 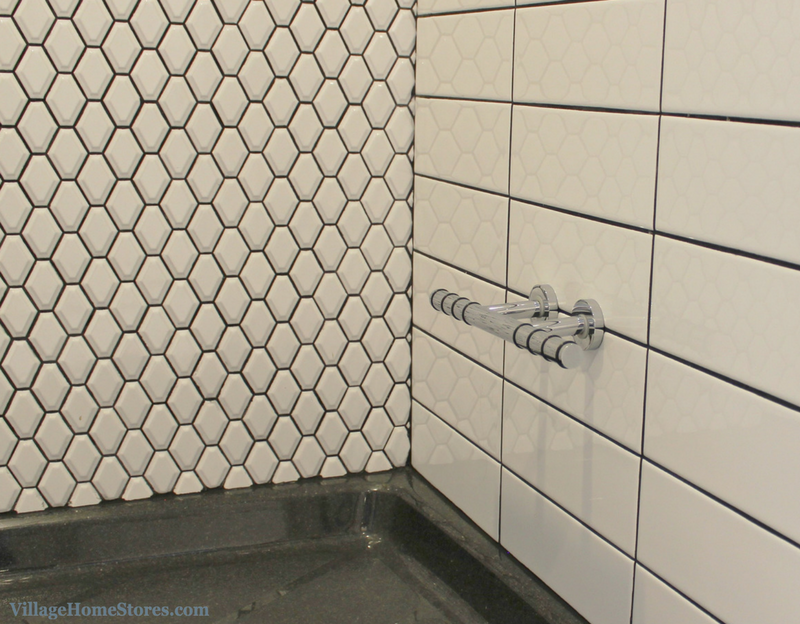 Many times custom tiled showers include a tiled base for the floor. 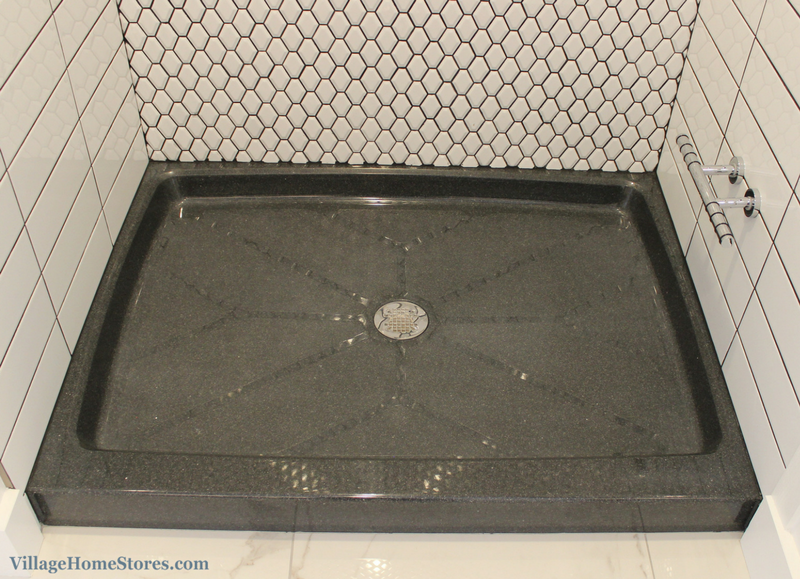 This customer wanted to avoid grout lines to be cleans on the floor and instead chose a stylish shower base custom made for her by the Onyx Collection. This base is poured in Kansas and available in many colors and can be customized to even the strangest of shapes. A textured pattern is included in the base for added traction. 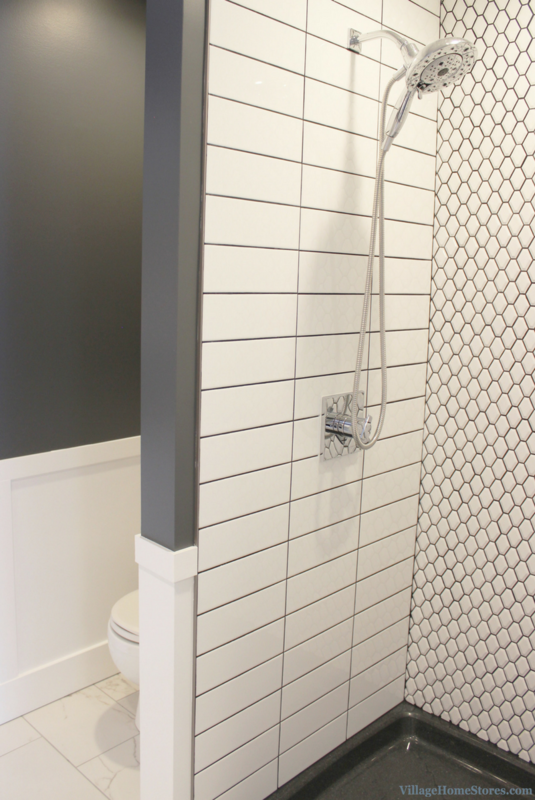 The color selected for this bathroom is named “Constellation” and it is a great compliment to the dark gray grout. 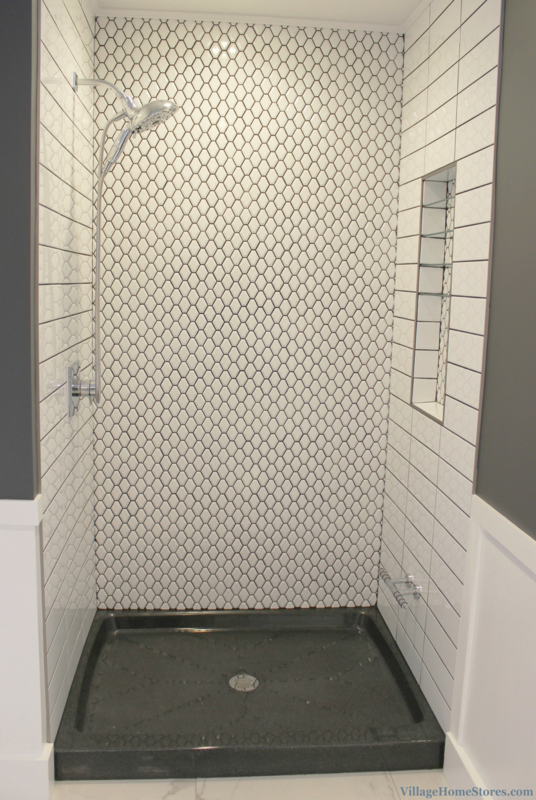 Find more inspiration for custom tiled showers over on our award-winning Houzz page. There you can browse ideabooks on tiled showers and see more custom niches and benches to help you get inspired for your own project. You can even find the album of photos from the kitchen in this same home. 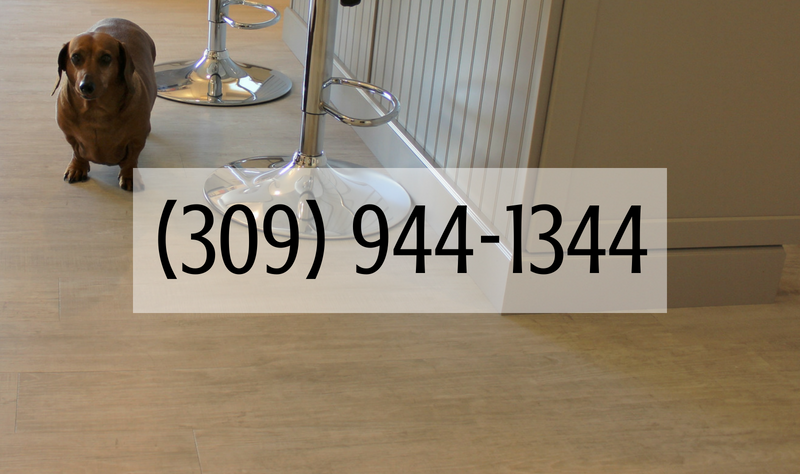 The flooring throughout the Master Bath and dressing areas is a 12″ x 24″ tile. This “Loppato Calacutta” tile is from our Florim line. Love the look of this space? See the full album of photos from this Master Suite remodel here on our Houzz page. This bathroom also included our stylish square-shaped switches from the adorne series by legrand®. Remodeling your Master Bathroom is a decision you will thank yourself for every day! You deserve your own Master Suite retreat that suites your own style. If you are you ready to see what your dream bathroom can look like we are here. Contact us today by completing this online form or call us to set up an appointment to walk through our process at (309) 944-1344.